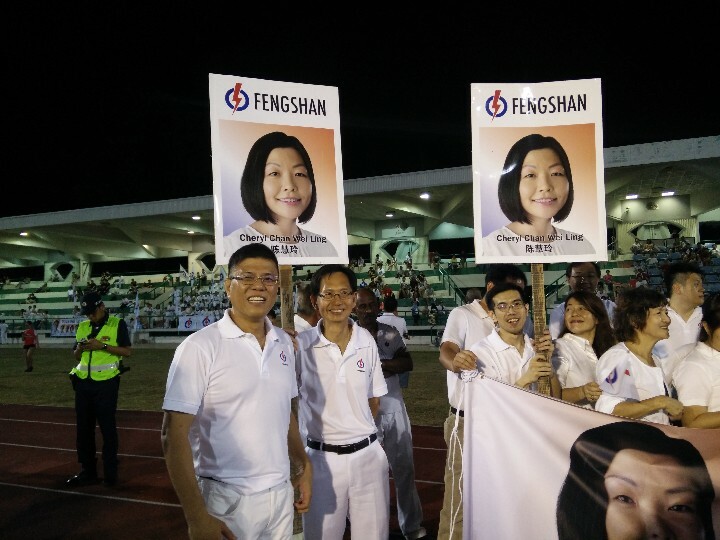 It was a heavyweight clash deemed too close to call. 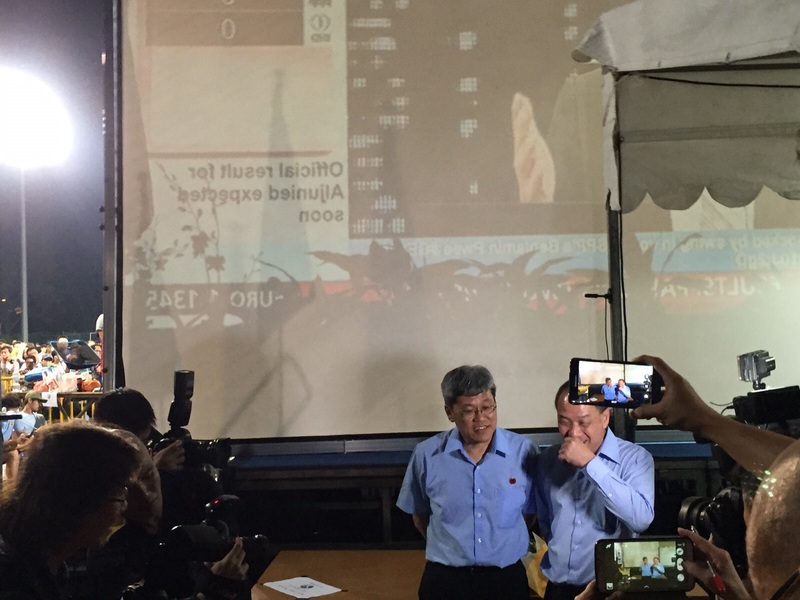 But when the dust finally settled in the battle for Marine Parade GRC, surprise greeted not so much the news of the victor, but the margin of the win. 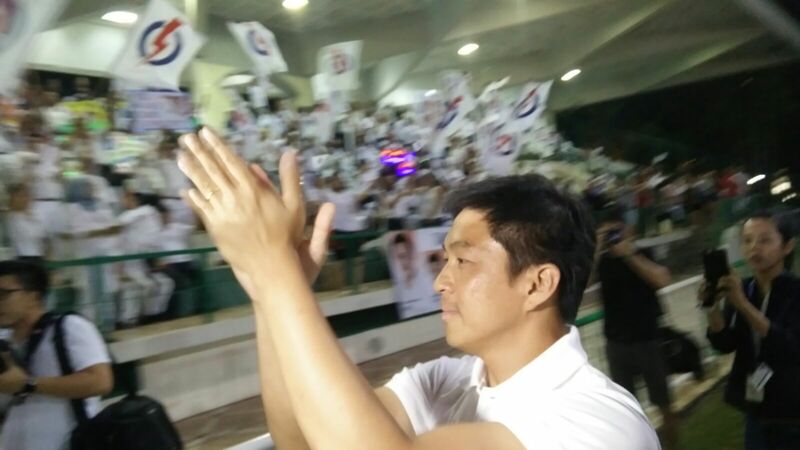 The People's Action Party (PAP) team, led by first-time anchor minister Tan Chuan-Jin, cruised to victory against the Workers' Party (WP), winning 64.07 per cent of the votes to strengthen their grip on the five-member group representation constituency (GRC). 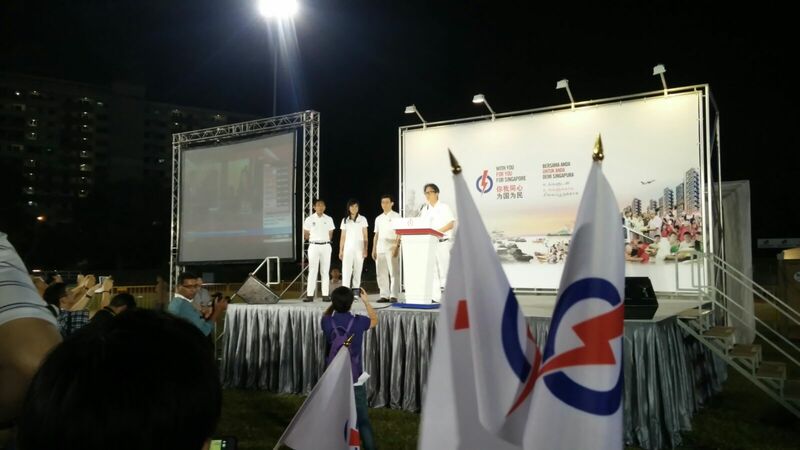 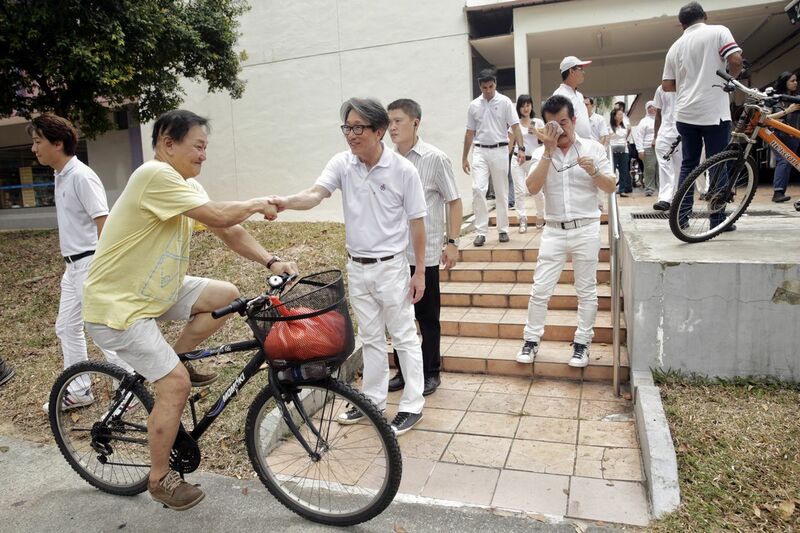 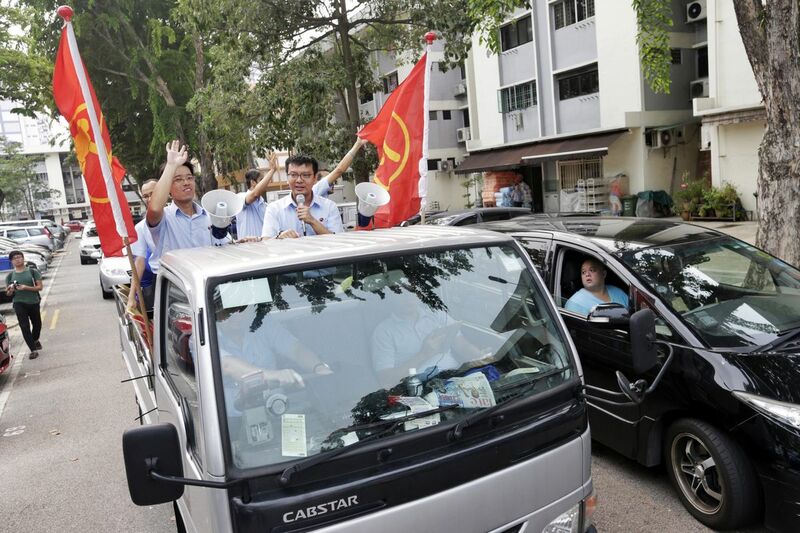 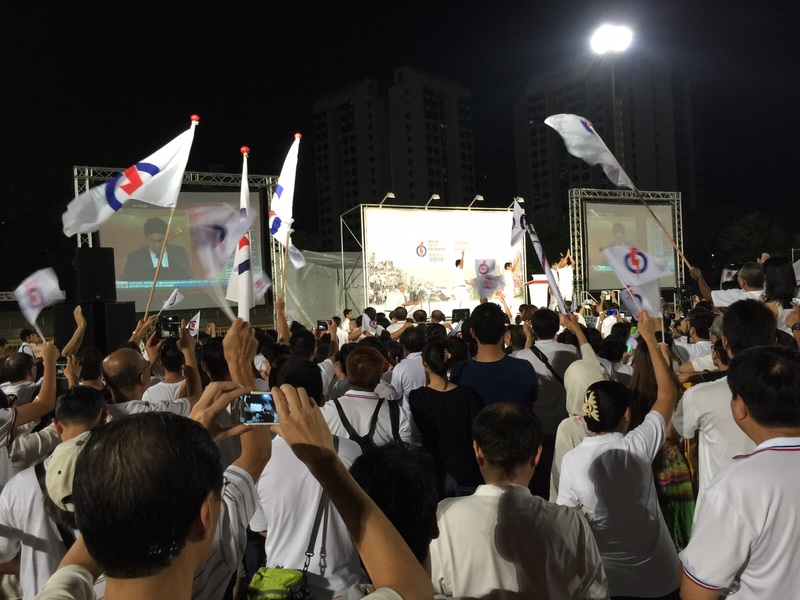 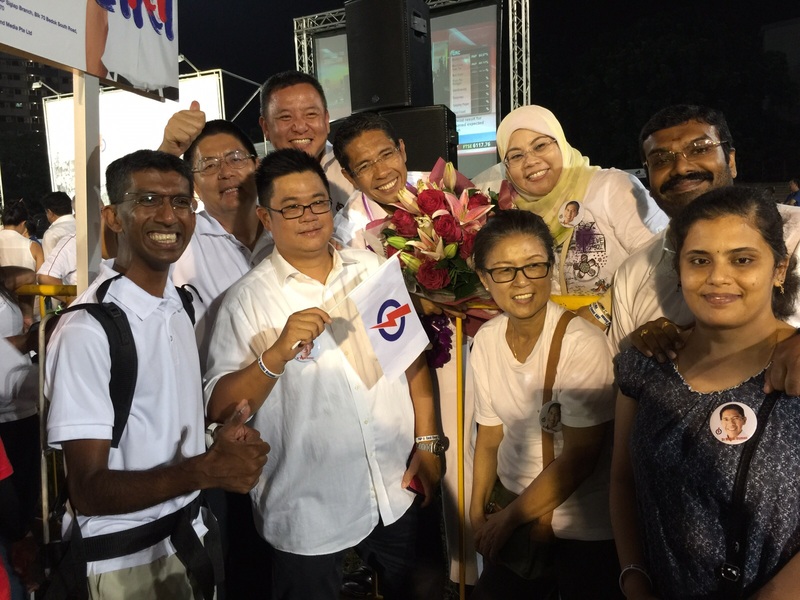 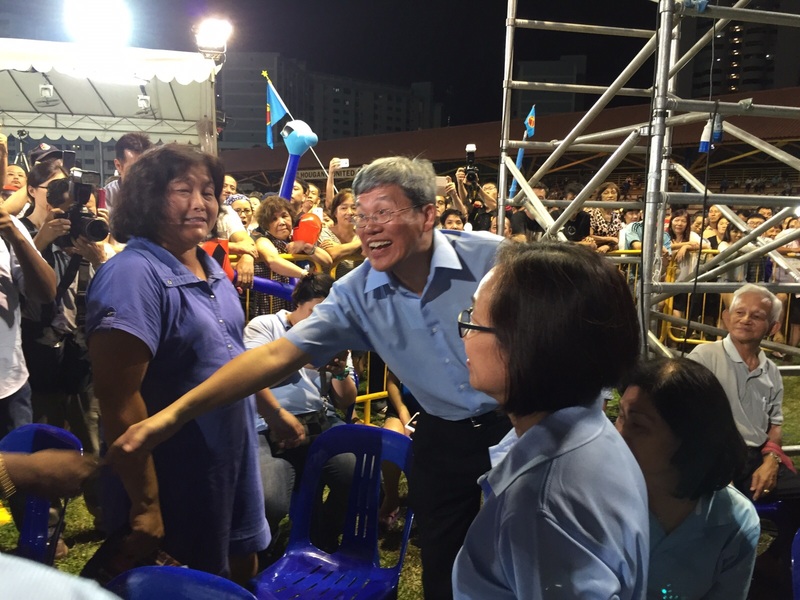 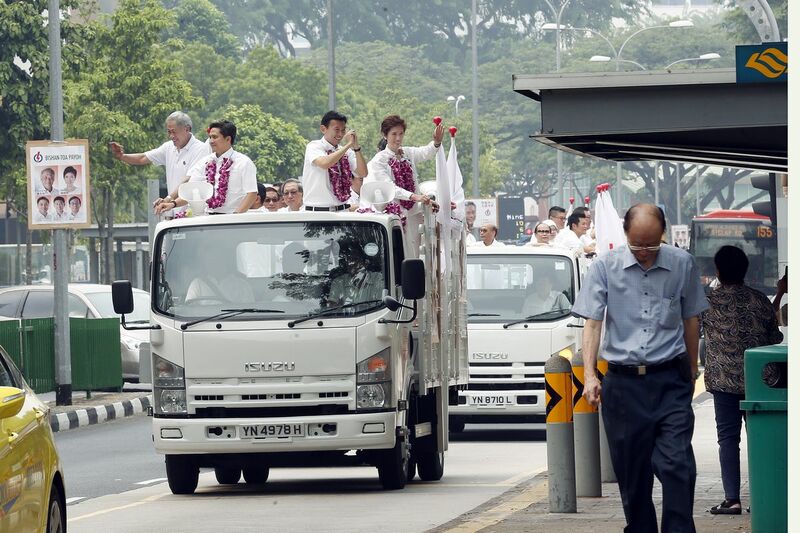 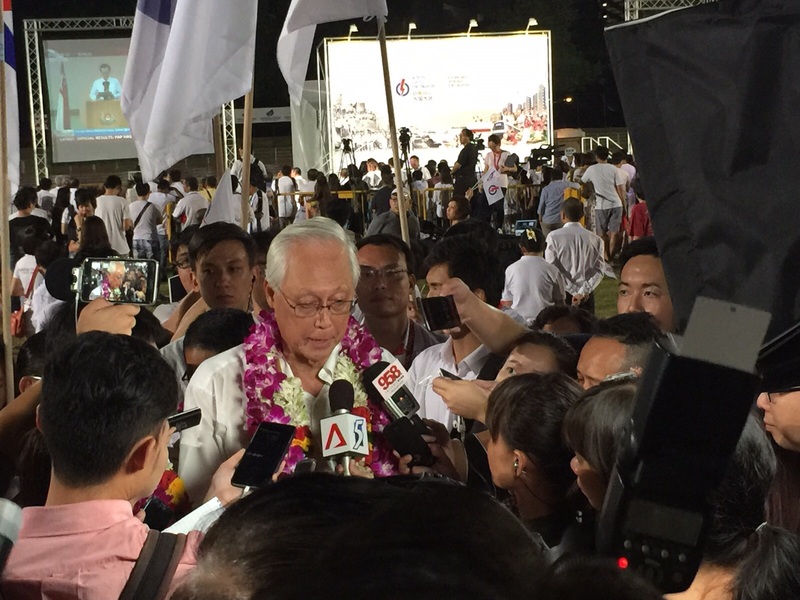 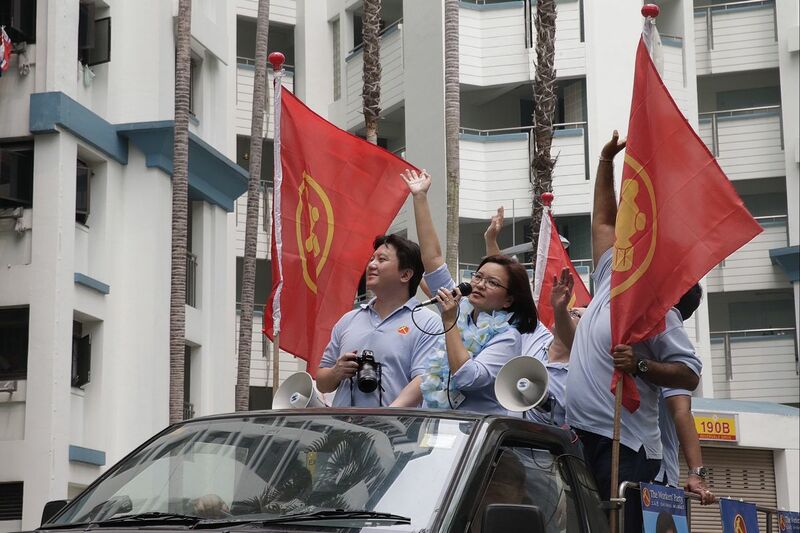 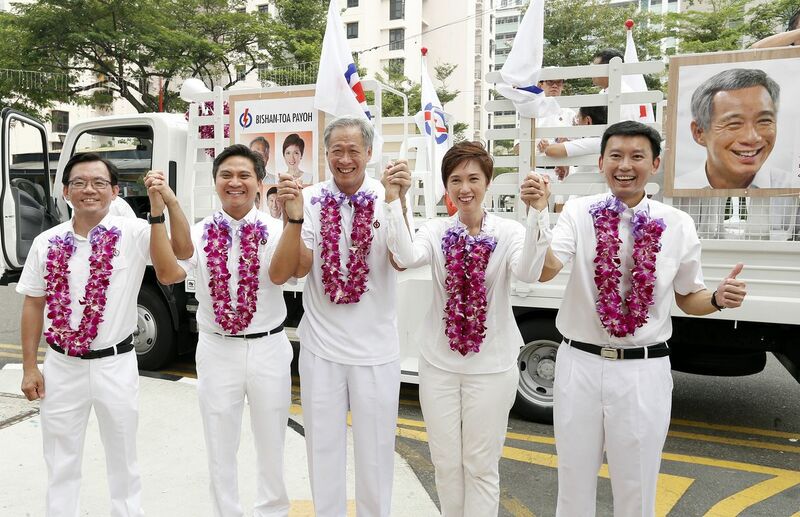 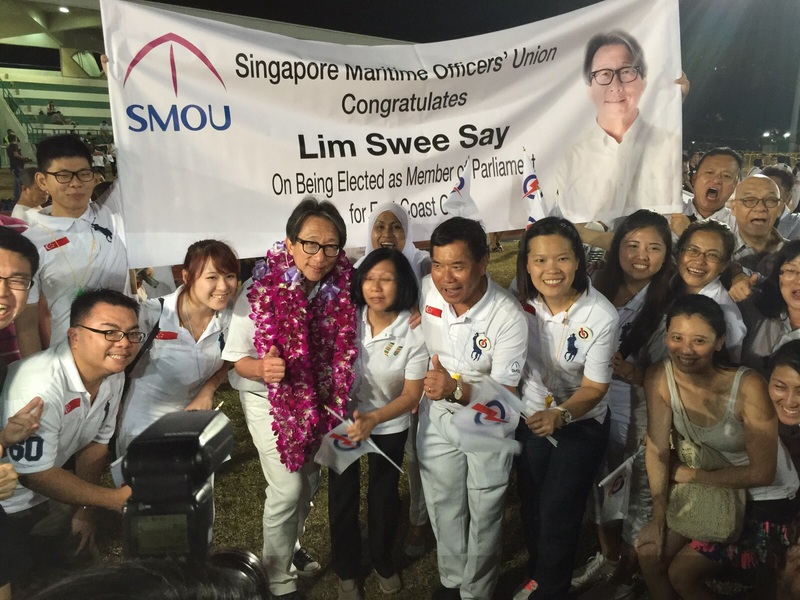 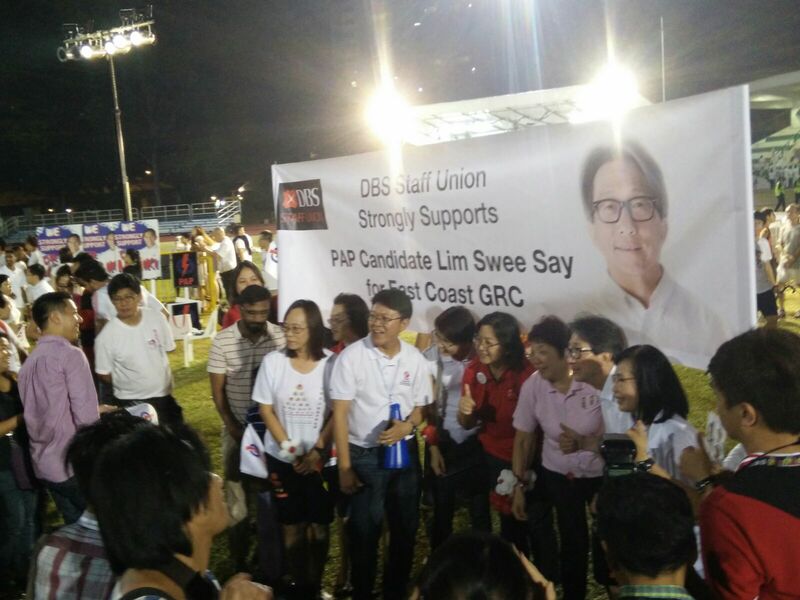 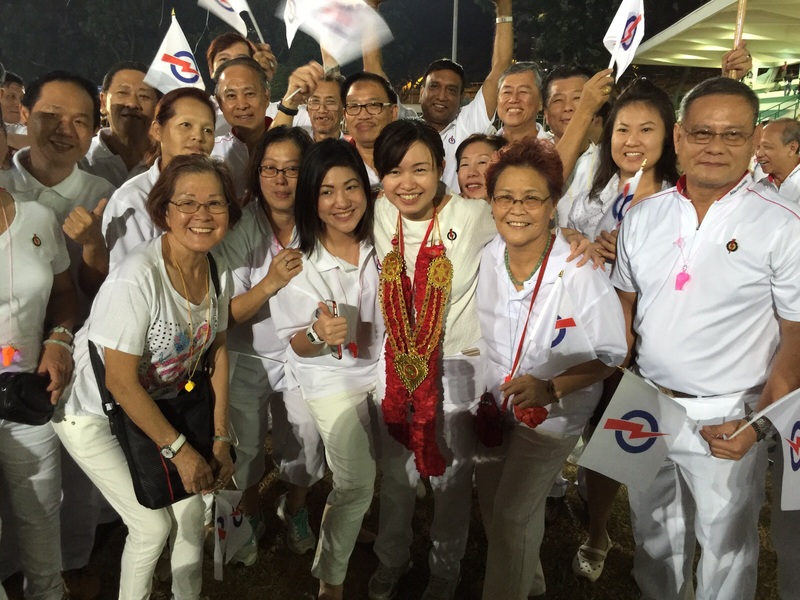 The advantage had been with the incumbent PAP team, which had held Marine Parade ever since it became a GRC in 1988. 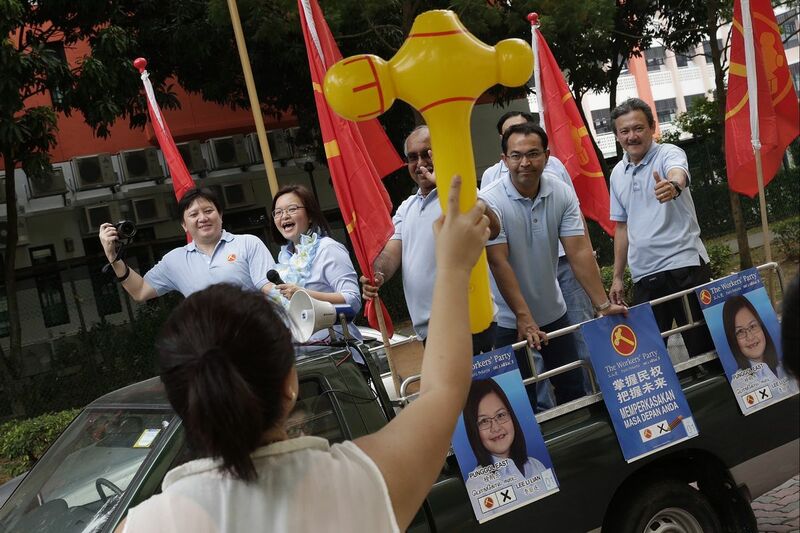 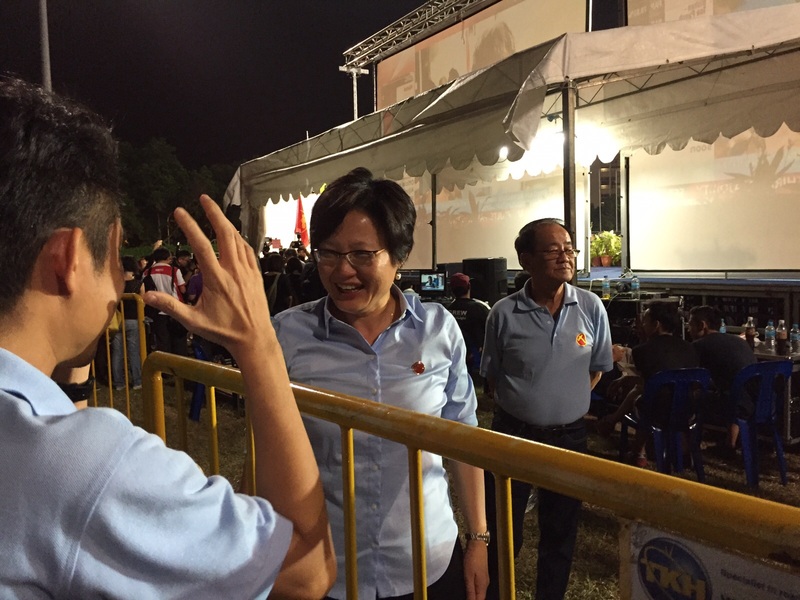 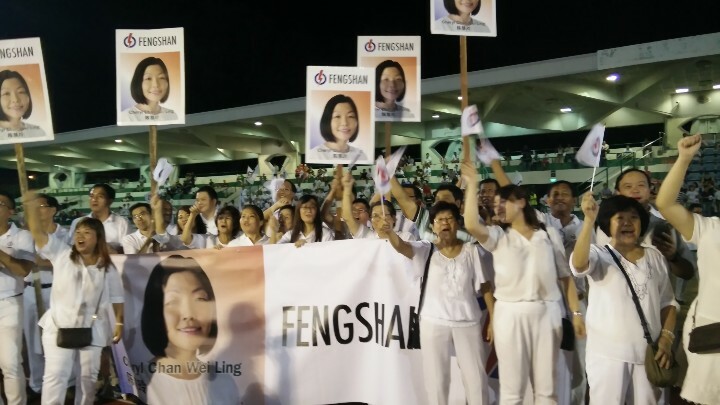 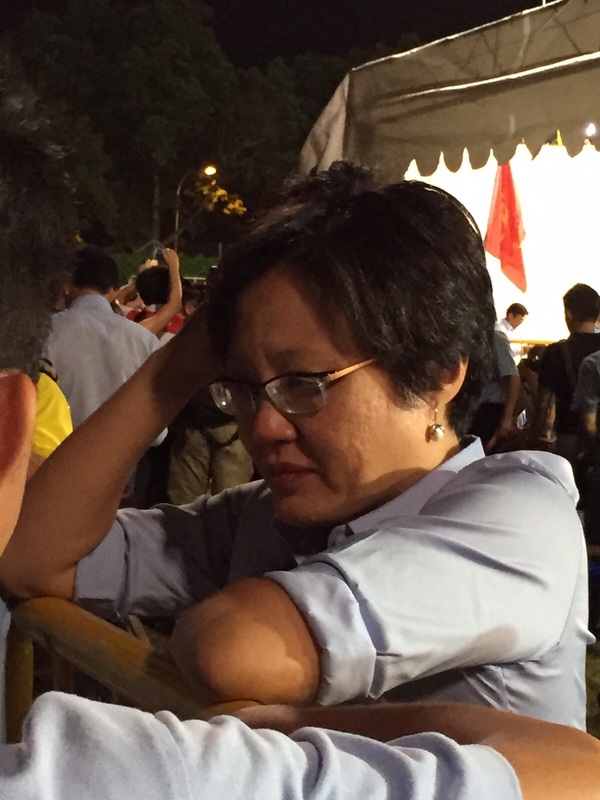 But after a narrow 56.64 per cent win against a relatively unknown National Solidarity Party team in 2011, many had anticipated a close fight, with Non-Constituency MP Yee Jenn Jong leading the opposition team. 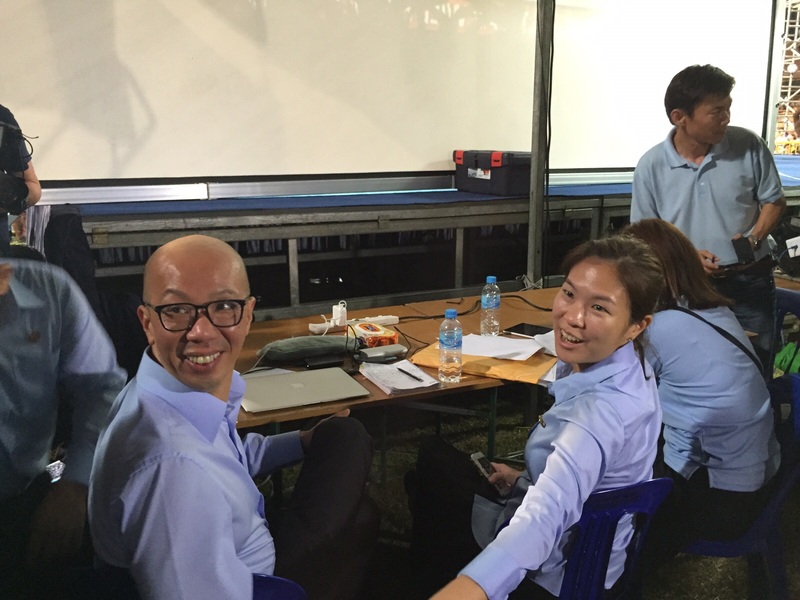 However, the WP team mustered only 47,629 of the 132,568 votes cast. 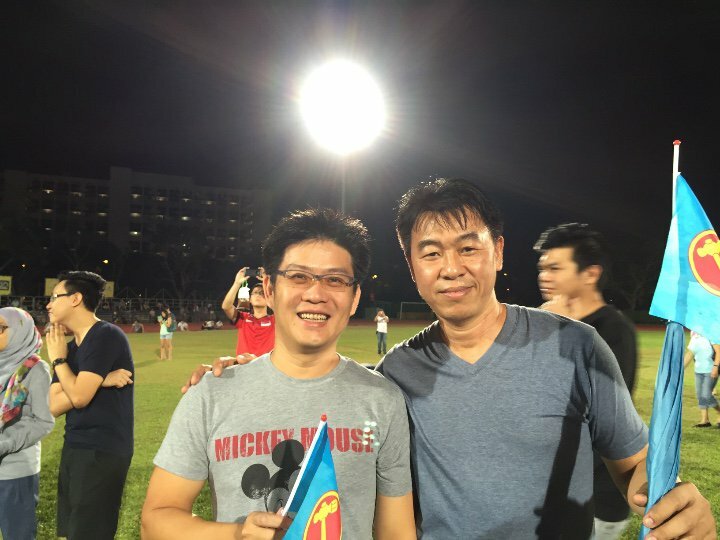 Mr Tan, 46, told The Straits Times: "The sentiments you pick up, you read online, then the bookie list was going around... 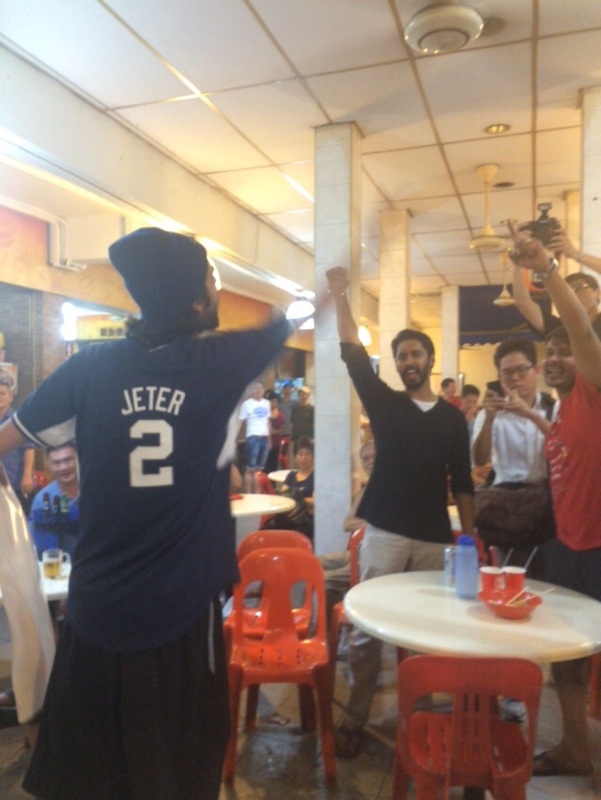 In that sense, it's been a lot more positive. 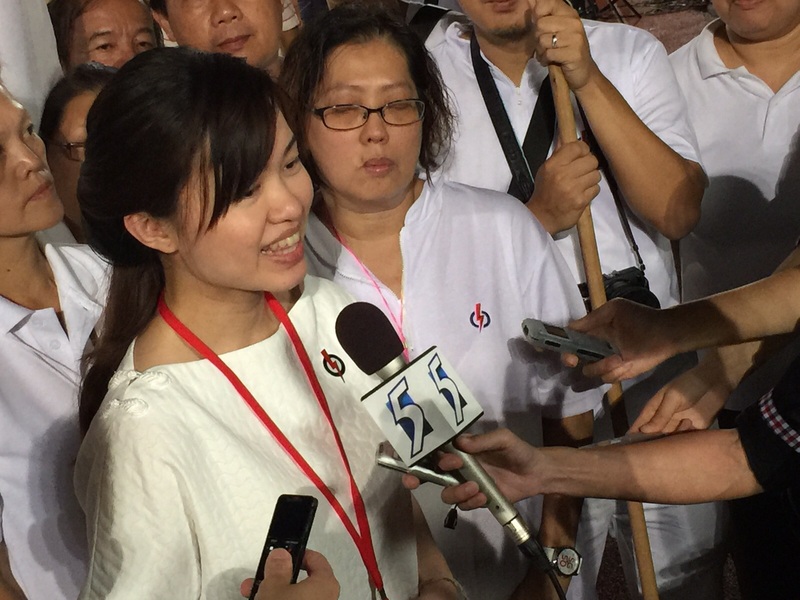 I had not expected (a win), not to this degree." 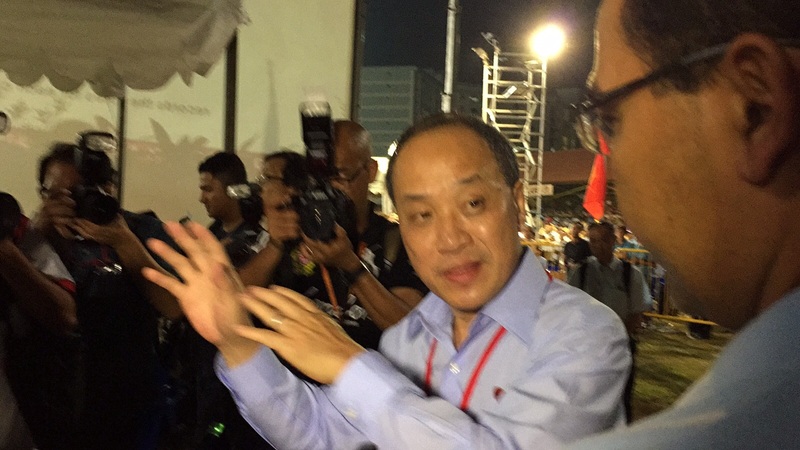 The Social and Family Development Minister added: "We just did what we believed is right. 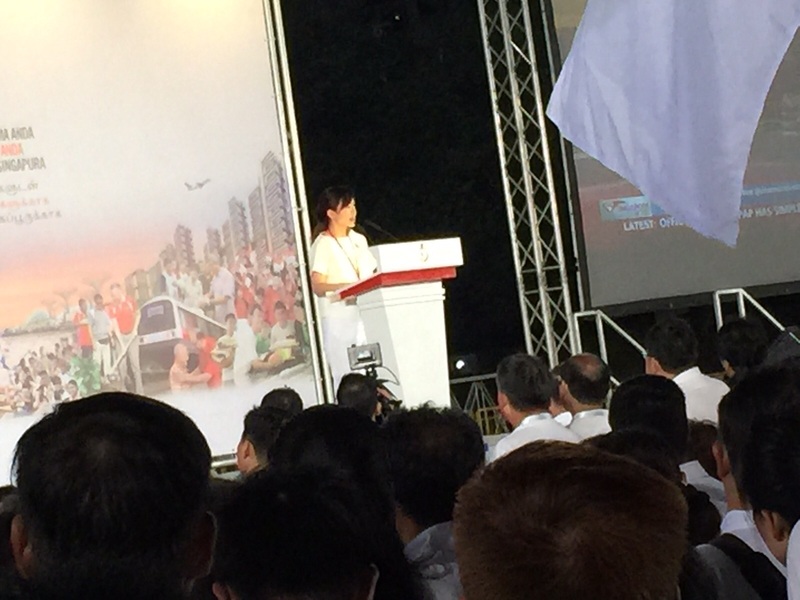 "We stuck to our principles, (we) stayed focused on the fundamentals. 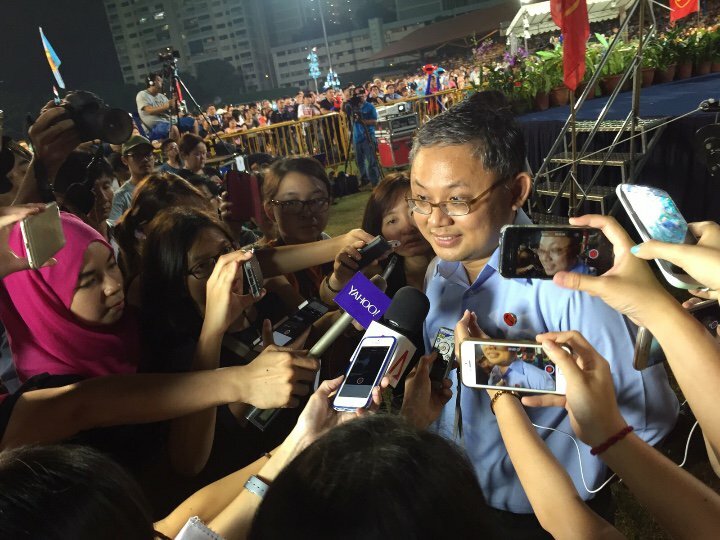 It's a bit like a leap of faith, (wondering) whether it will translate to support?" 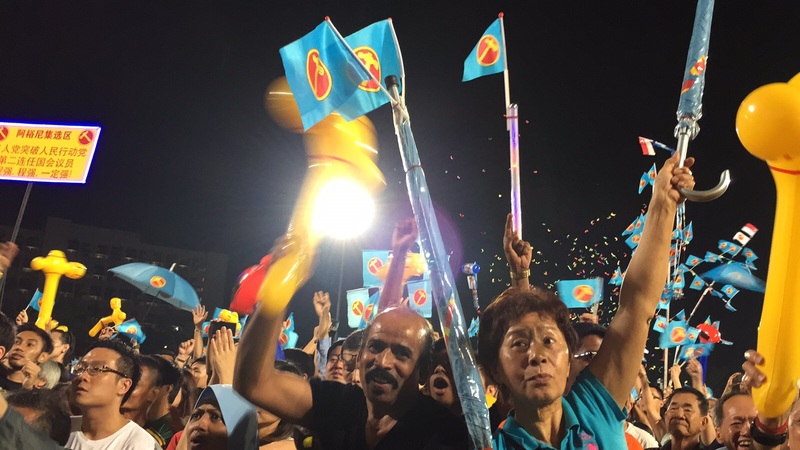 The widely-anticipated keen fight between a team with a minister and a former prime minister and the WP's second-best team fizzled out fairly early on. 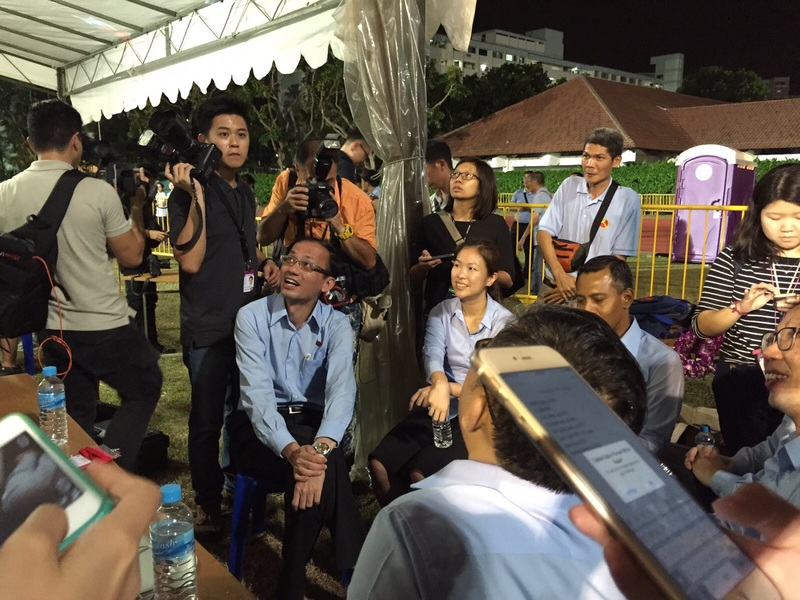 The sample count results confirmed what the PAP had been hearing throughout the night: that they had the edge. 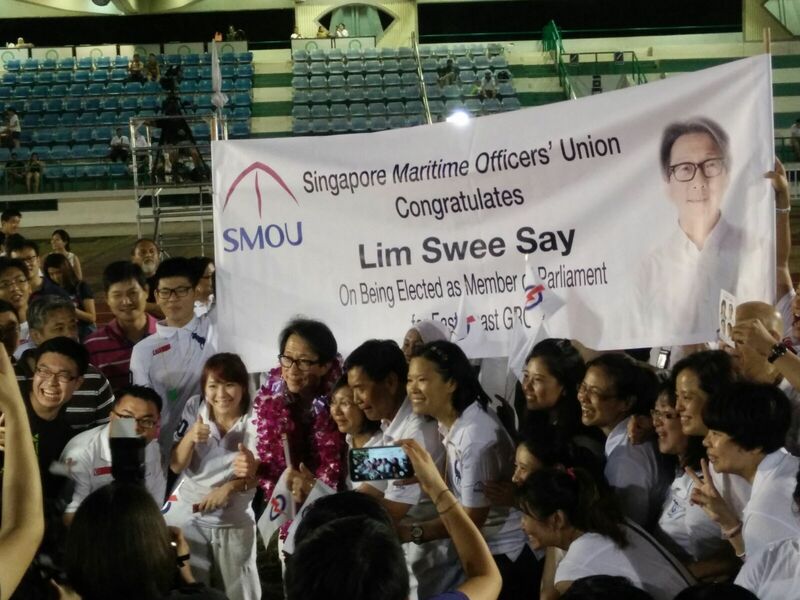 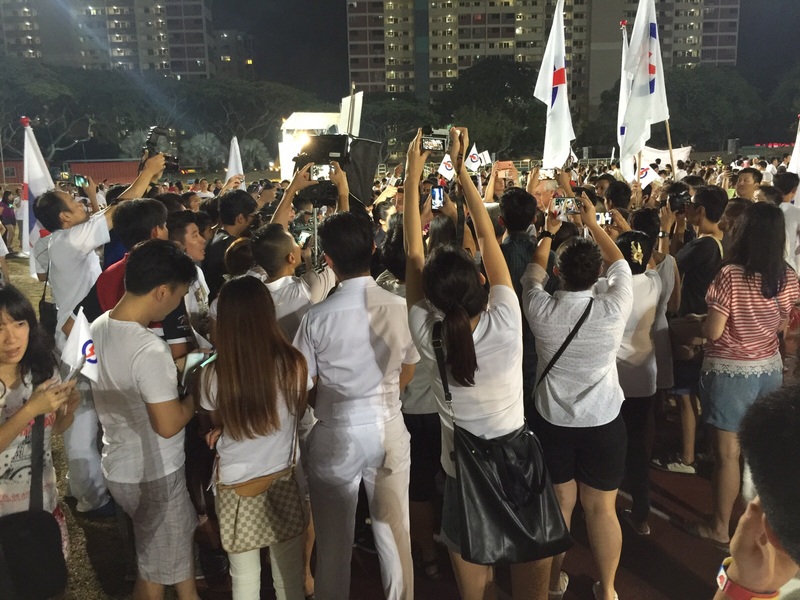 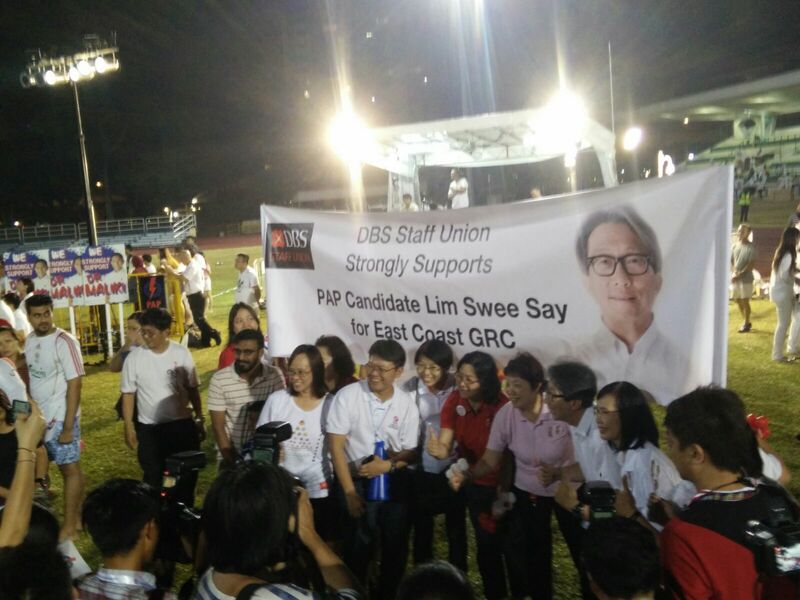 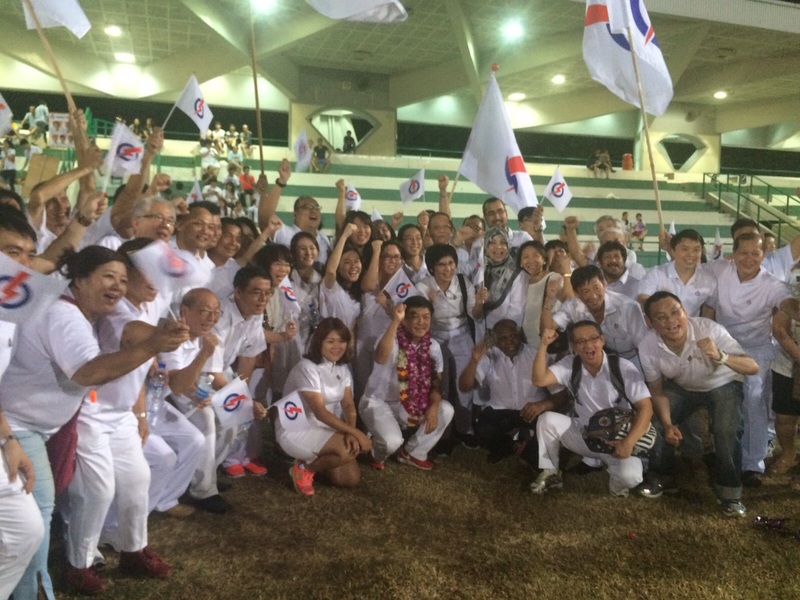 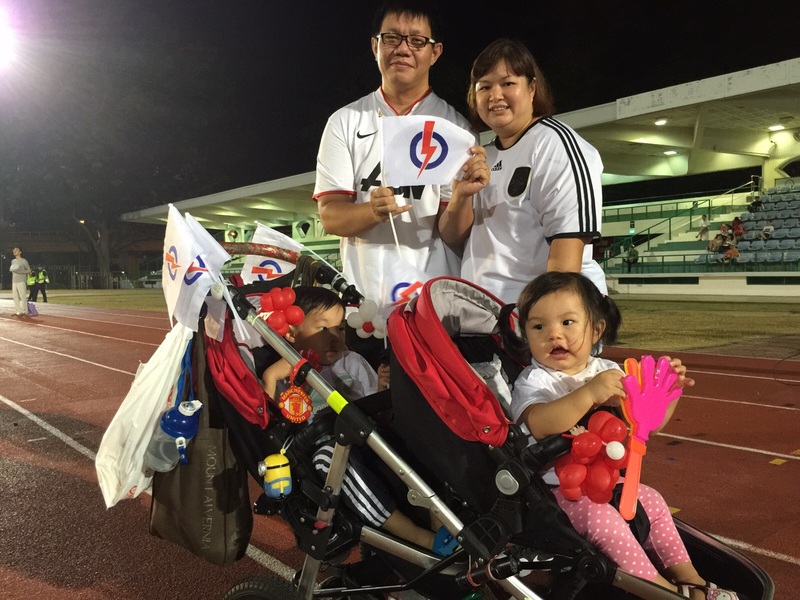 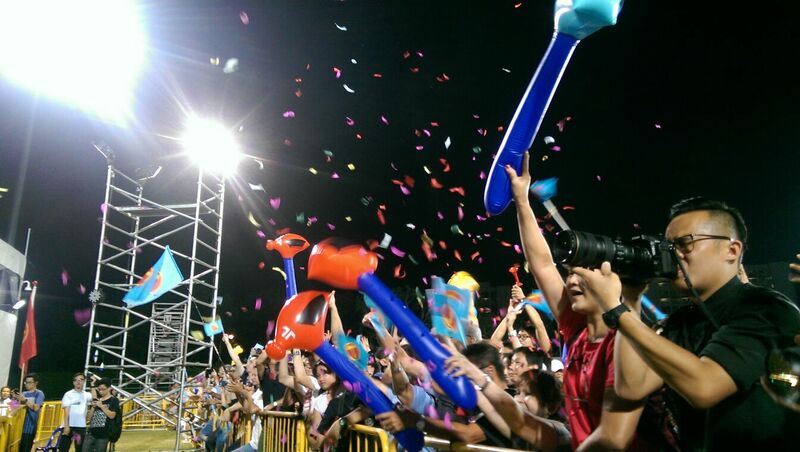 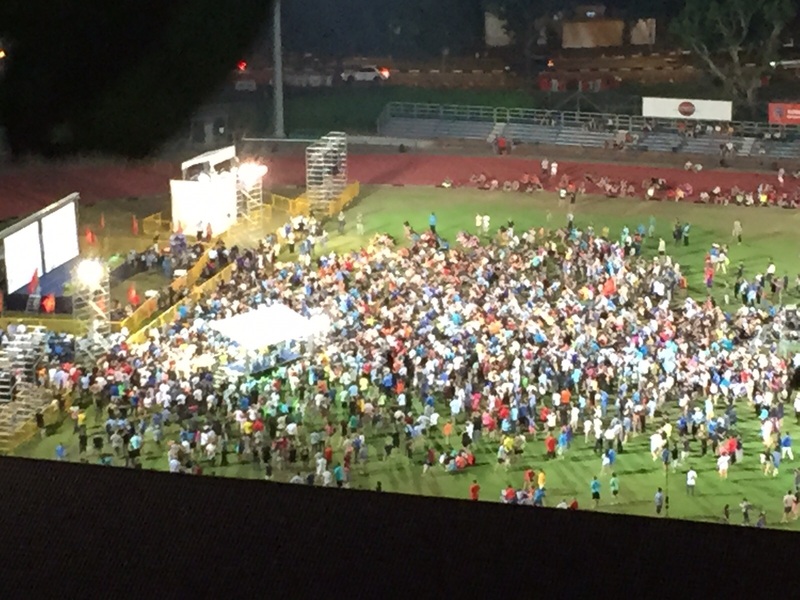 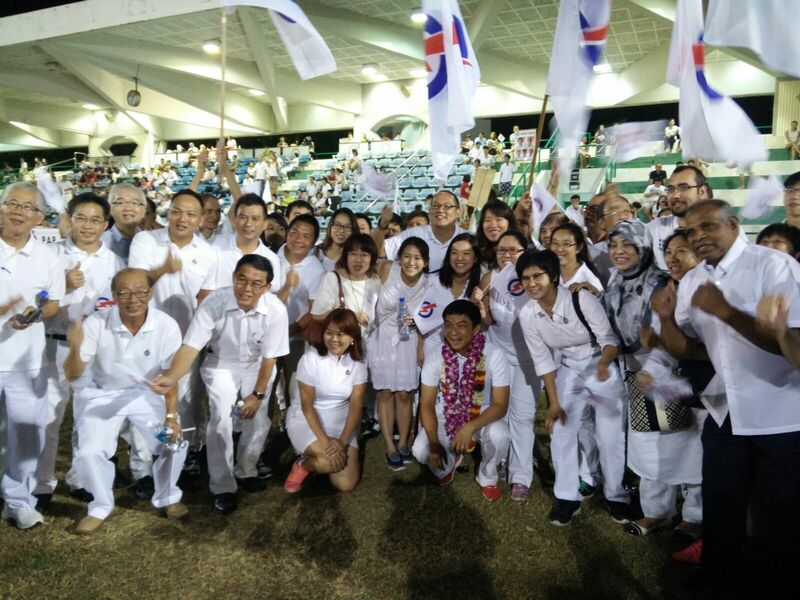 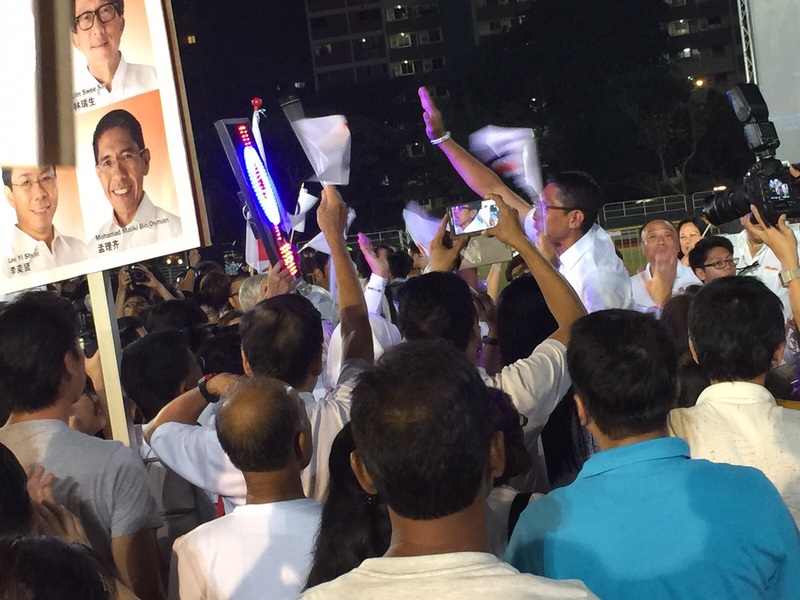 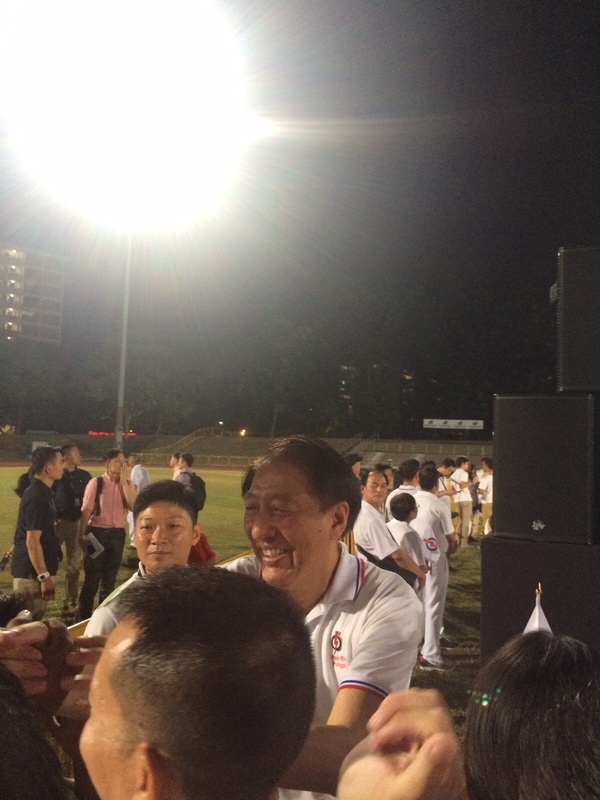 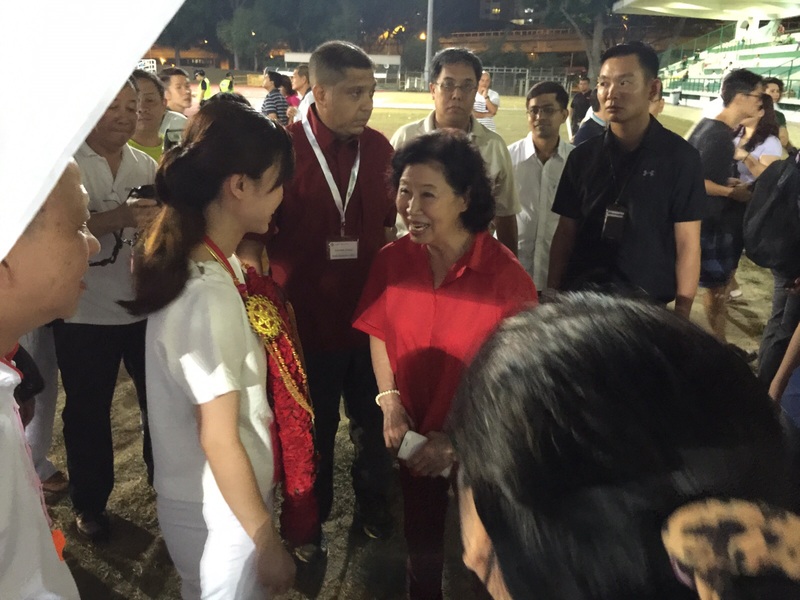 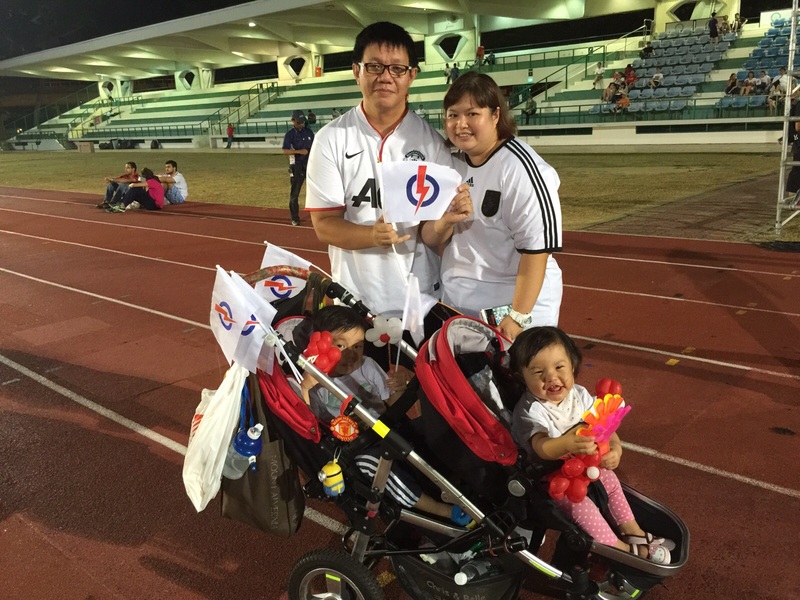 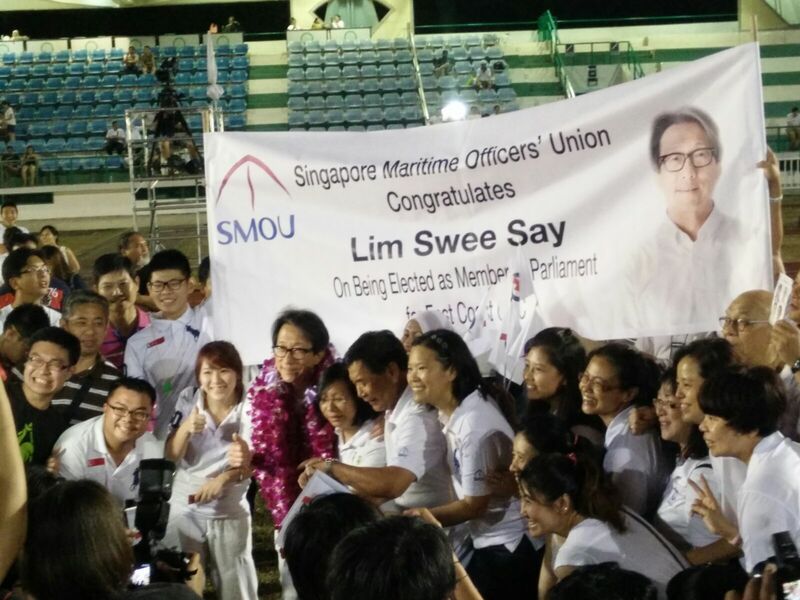 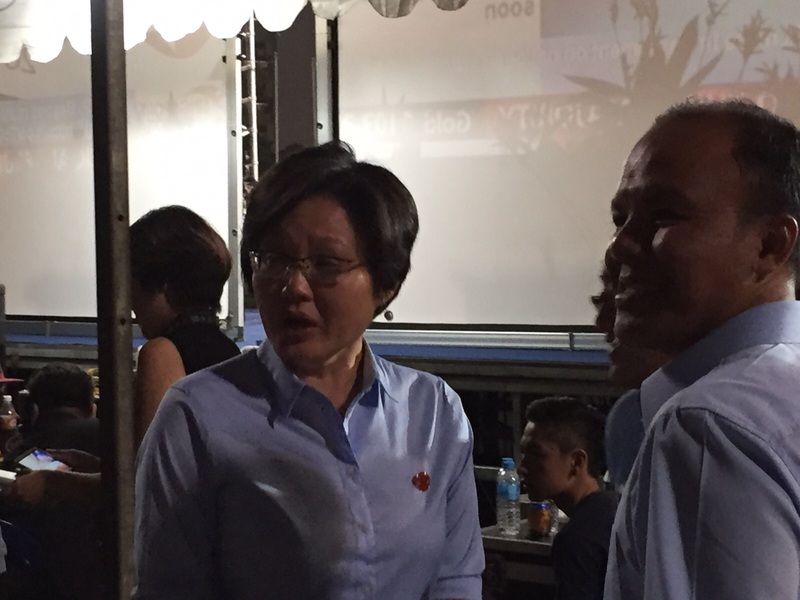 The team joined supporters at Bedok Stadium shortly after 10pm and were greeted with loud cheers when the results were confirmed. 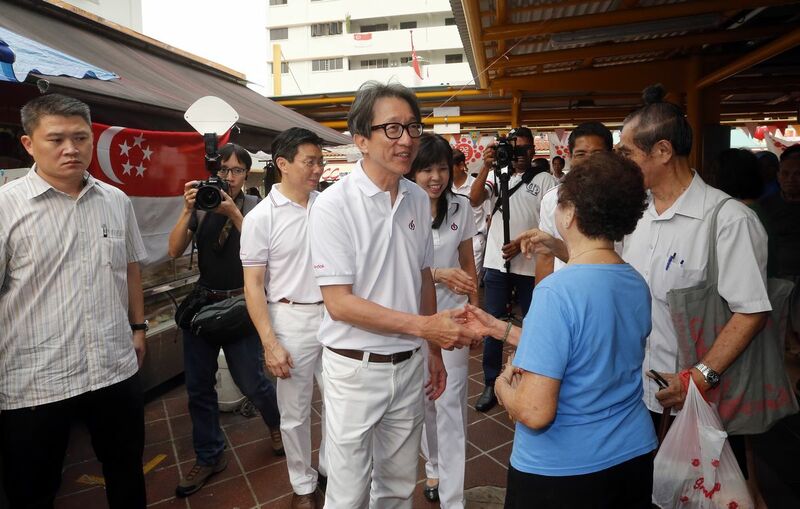 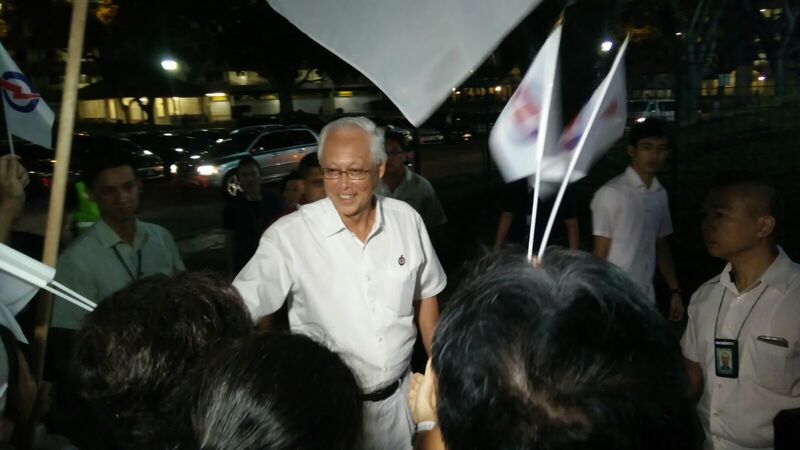 Mr Tan and his teammates - Emeritus Senior Minister Goh Chok Tong, 74, and incumbents Mr Seah Kian Peng, 53, Ms Fatimah Lateef, 49, and Mr Edwin Tong, 46 - pledged to continue putting residents first. 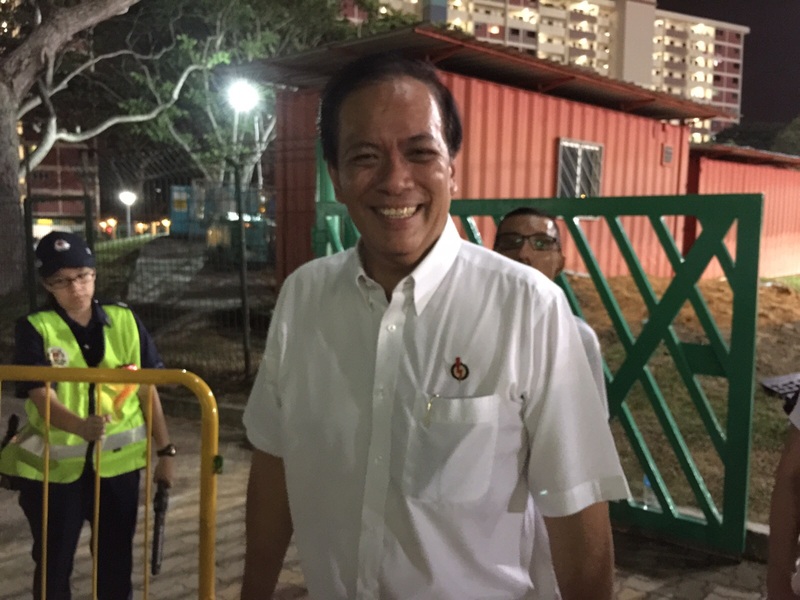 Said Mr Tan, who built his campaign around house visits: "Our focus will always be on our people and our nation that we love and we call home. 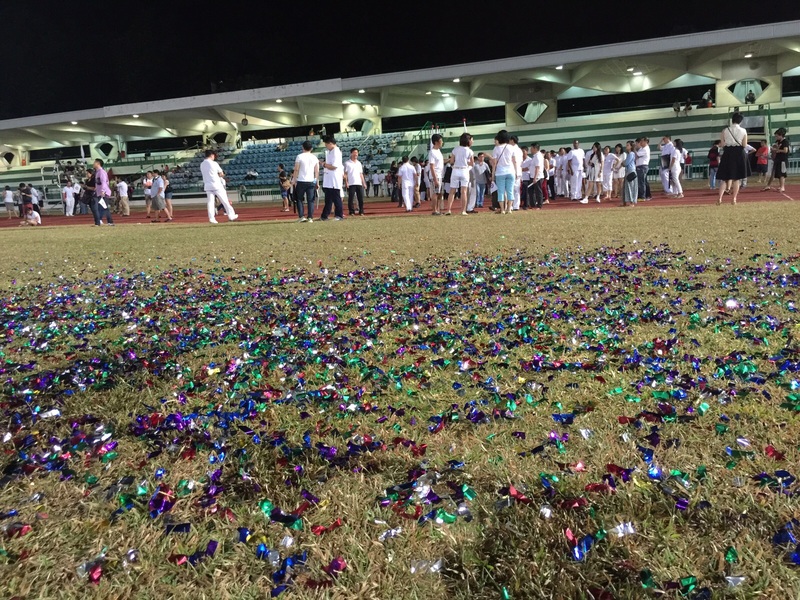 And we will never lose that focus. 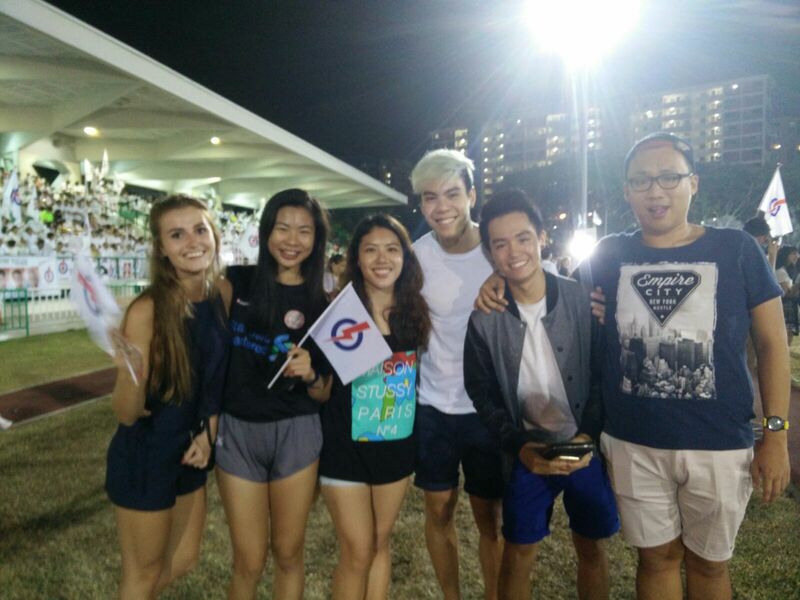 "We may be of different colours, we may have different views. 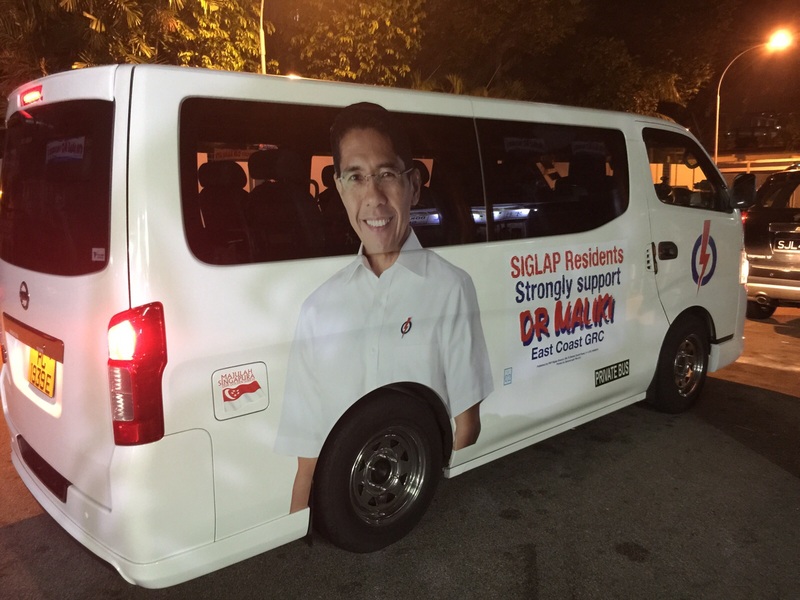 "But we can be a better society and we will be a great nation. 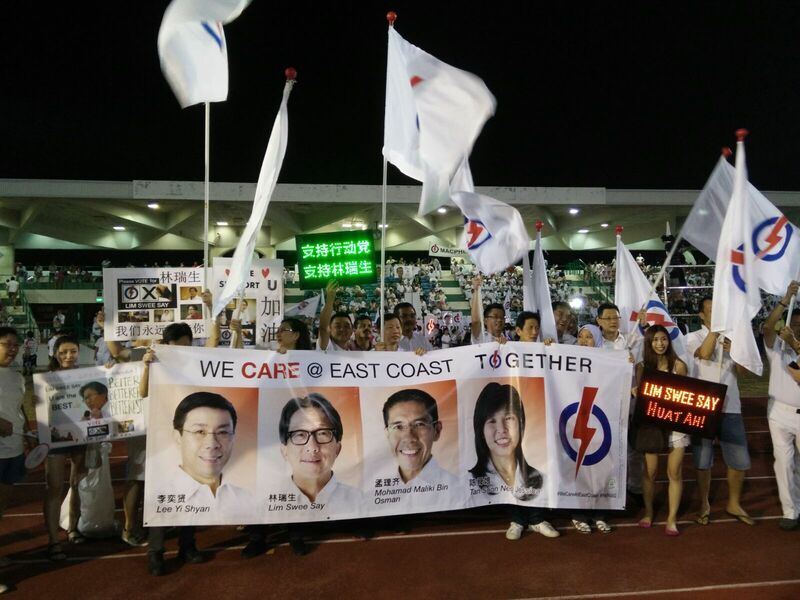 Whatever happens tonight, let us come back tomorrow as one." 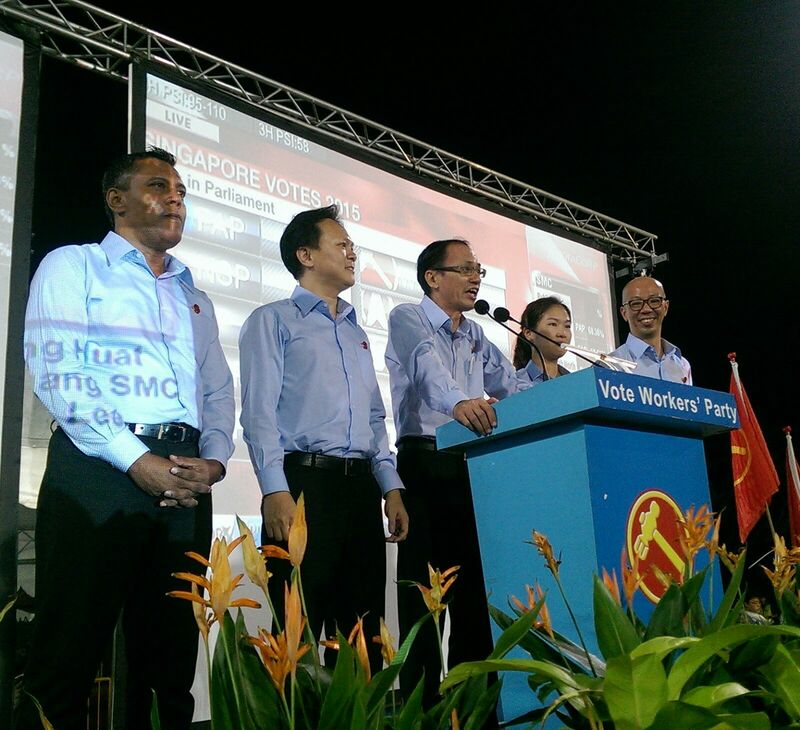 Mr Goh, who will serve his 10th term in Parliament, said: "The people have spoken. 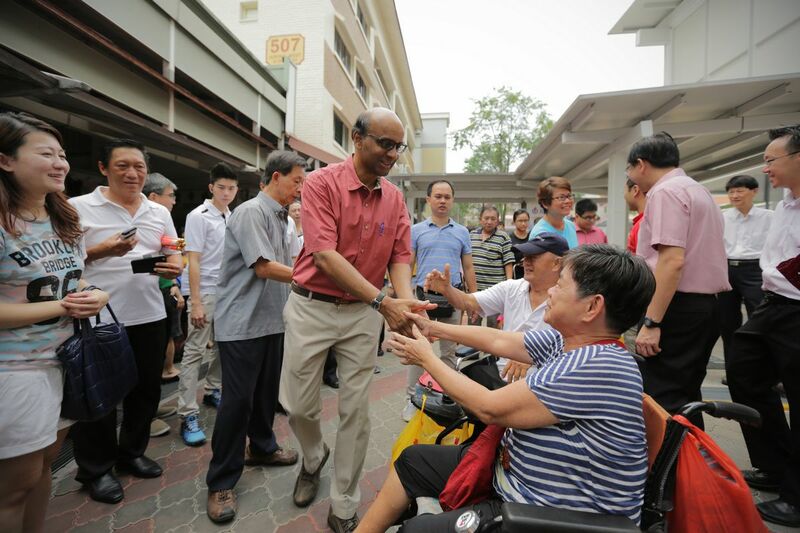 Deputy Prime Minister Tharman Shanmugaratnam welcomed by residents at Jurong West Street 52. 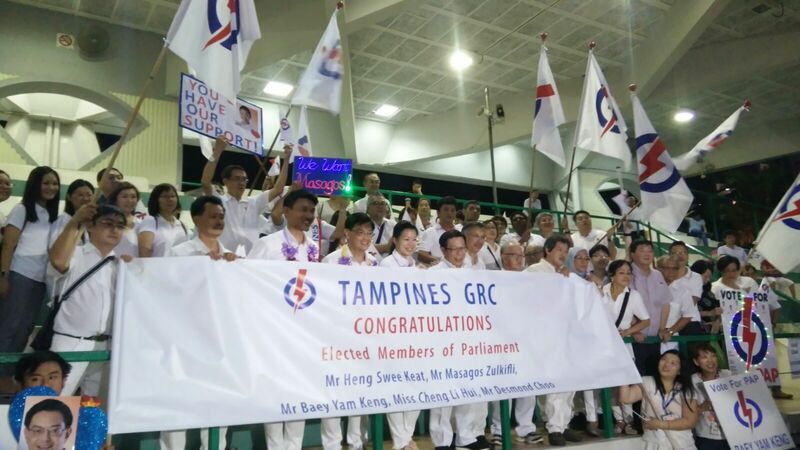 "They have supported the PAP in a very clear way and they have given a very strong mandate to (Prime Minister Lee Hsien Loong) and his team, his programme for the last four, five years and his agenda for the future. 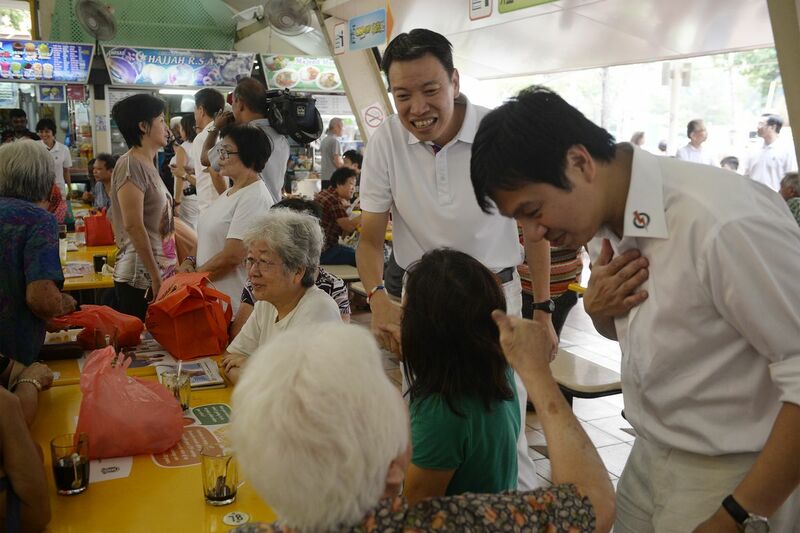 "This mandate has enabled PM to carry on with his pledge to build for Singapore a fourth-generation team that will take Singapore over the next 10 to 15 years." 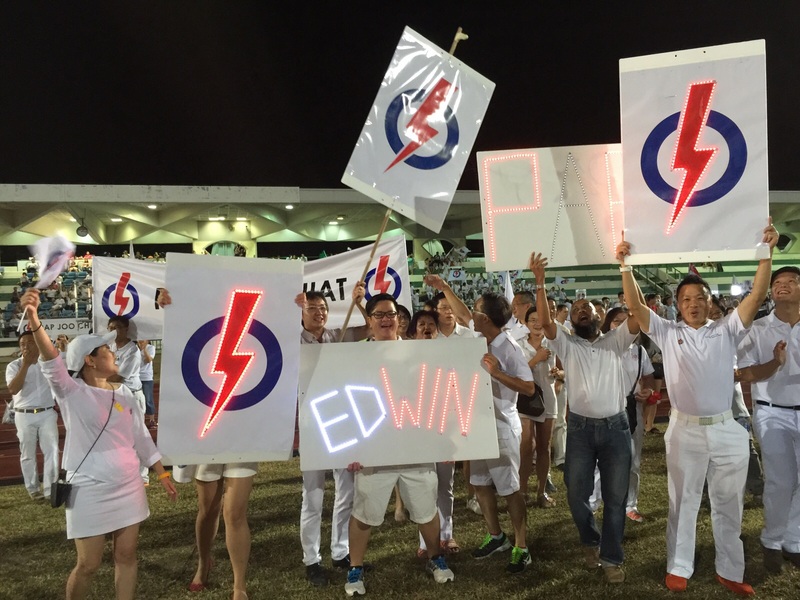 Mr Goh's comments on opposition parties had drawn some flak from netizens and resulted in a war of words between the WP and the PAP. 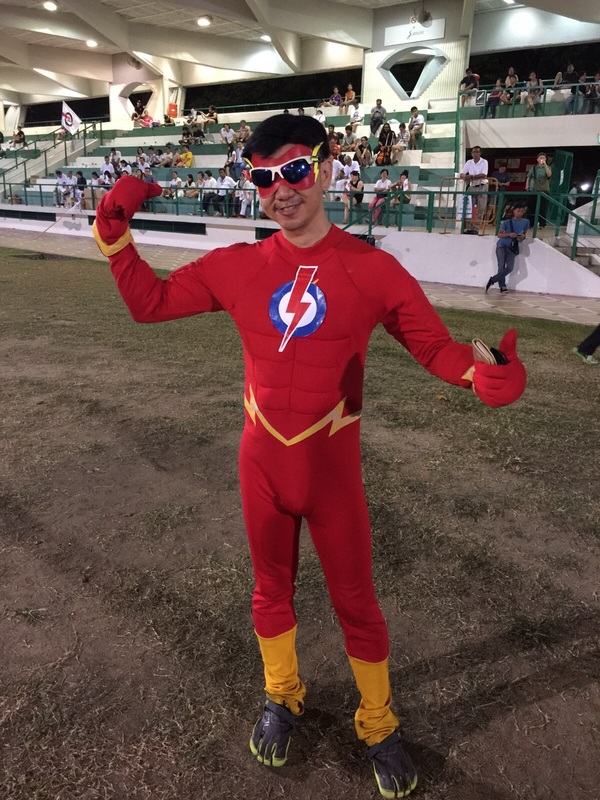 He had countered the WP's claim that having more opposition voices led the Government to adopt more inclusive policy measures, likening it to the story of the rooster boasting that its crowing causes the sun to rise. 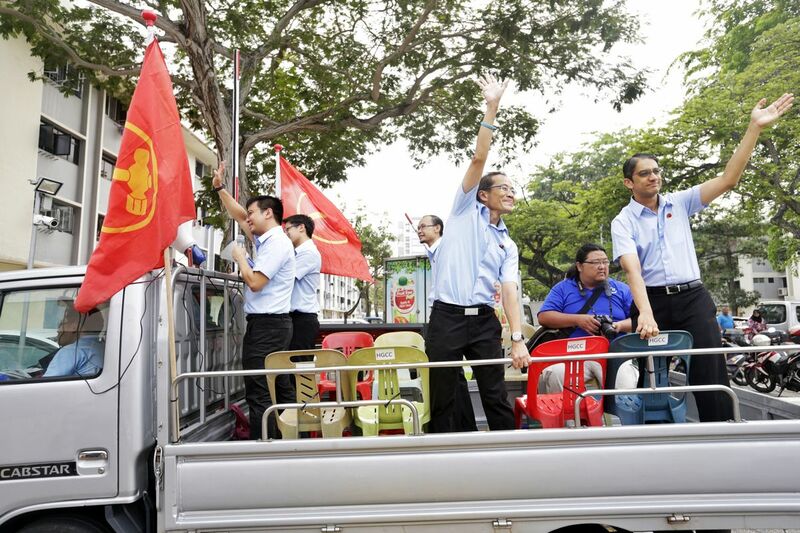 Besides calling opposition parties "nomads" who do not have an interest in the people's welfare, Mr Goh also said that voting for the opposition was like taking a gambling cruise ship to nowhere. 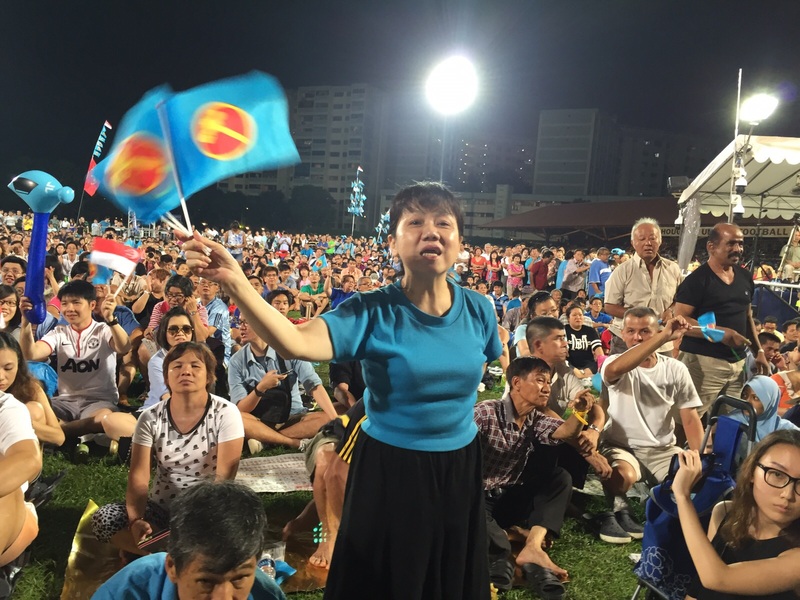 The WP team, comprising Mr Yee, 50, lawyer Terence Tan, 44, chocolate factory owner Firuz Khan, 48, corporate lawyer He Tingru, 32, and wealth manager Dylan Ng, 40, said they respected the people's decision. 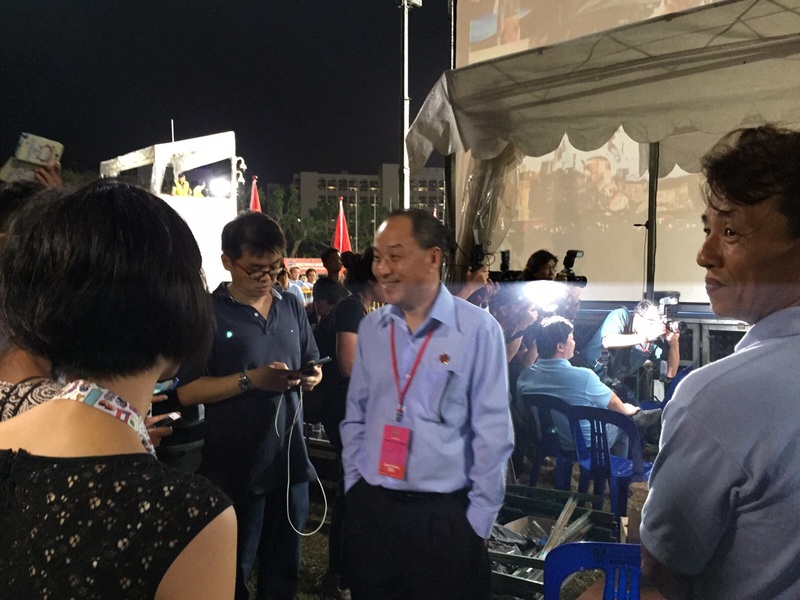 Said Mr Yee, an education business owner: "I pray that passionate people that we have put forward this time round will... continue this very difficult journey to build a responsible, respectable and rational party." 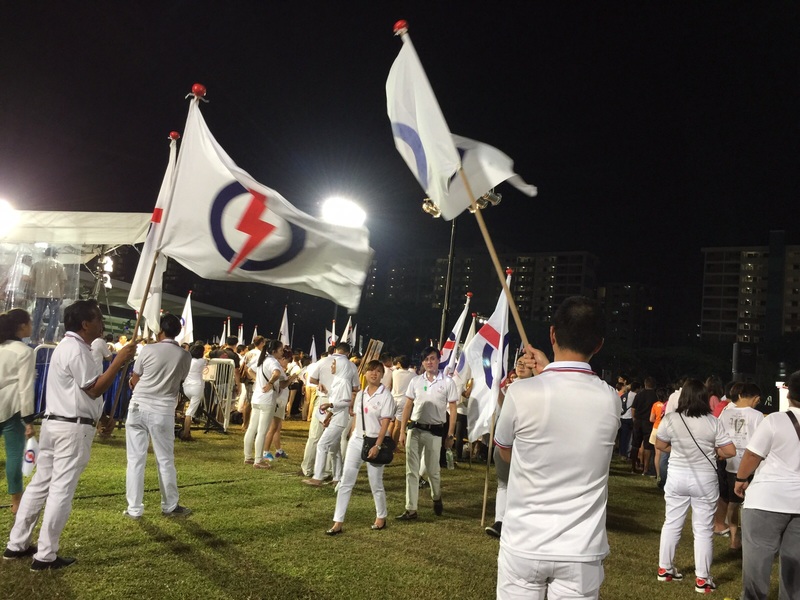 This article was first published on September 12, 2015. 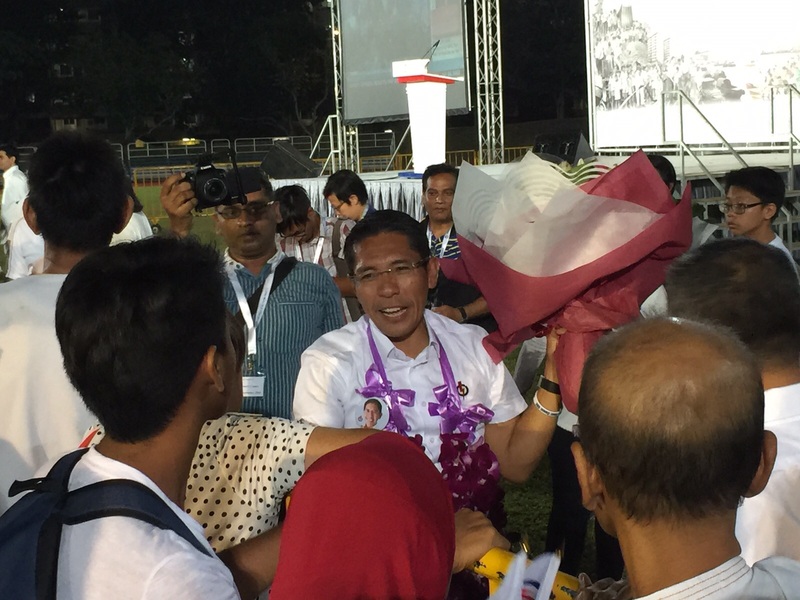 The Workers' Party has retained Aljunied GRC by a narrow margin, with 50.95 per cent of the votes. The margin of votes was close enough that the People's Action Party team applied for a recount, but they were ultimately edged out with 49.05 per cent of the vote. 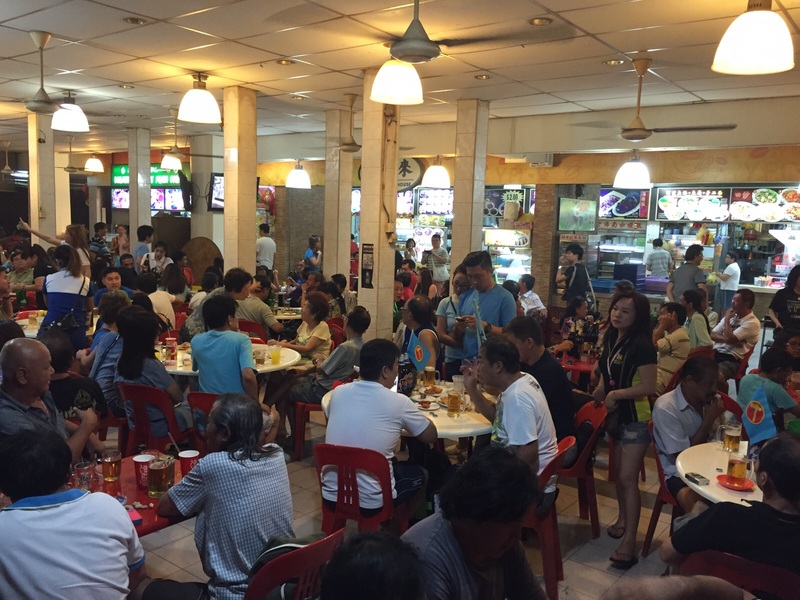 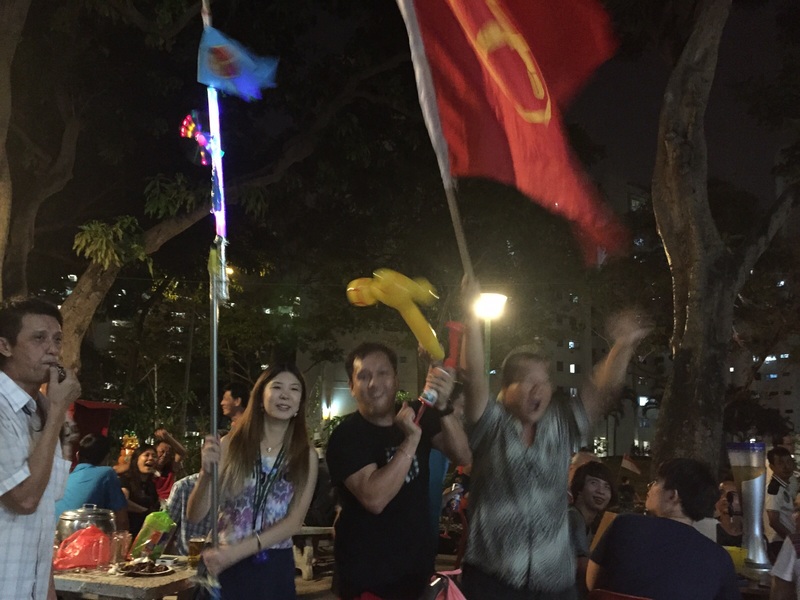 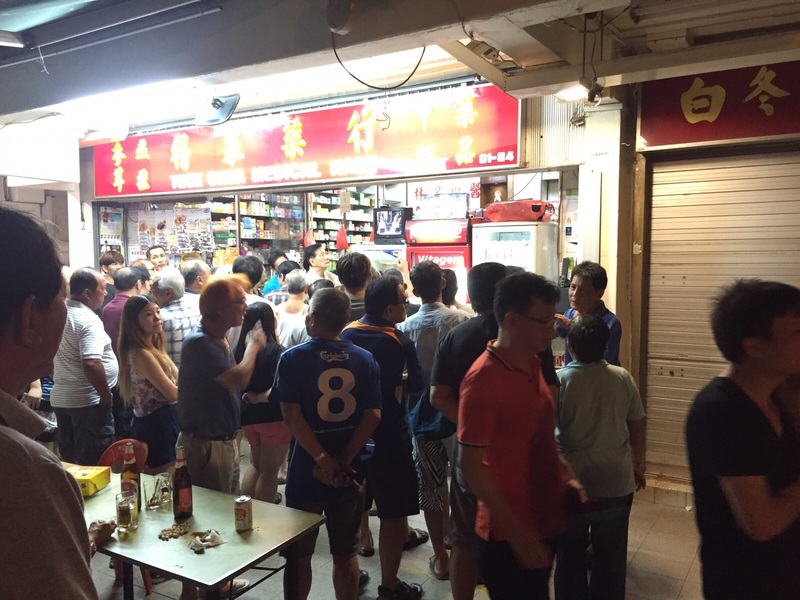 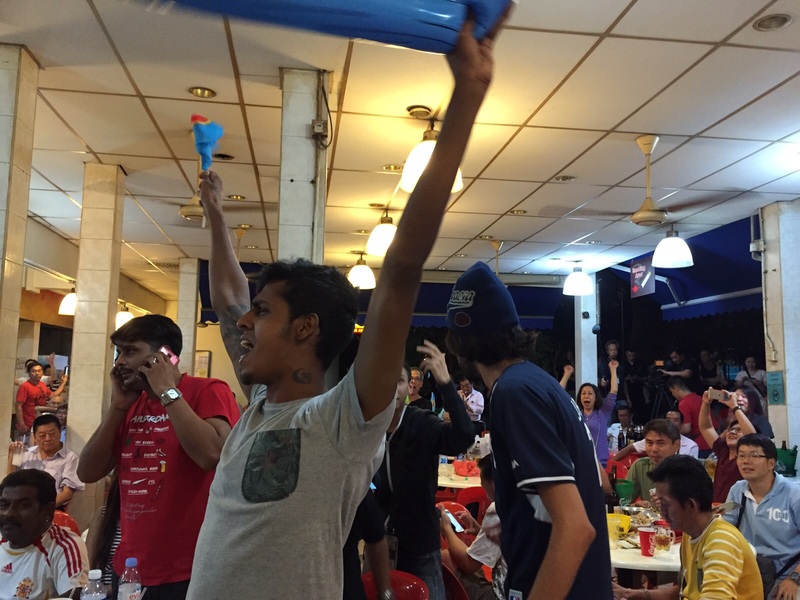 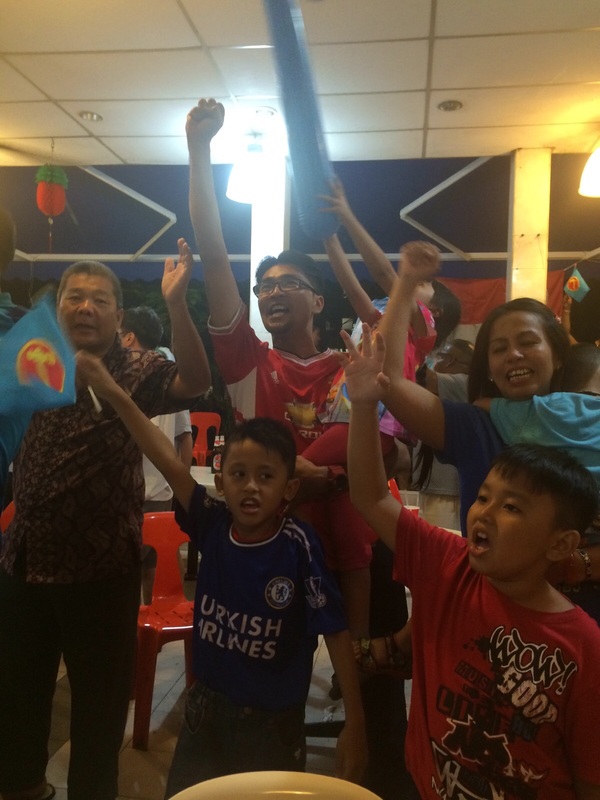 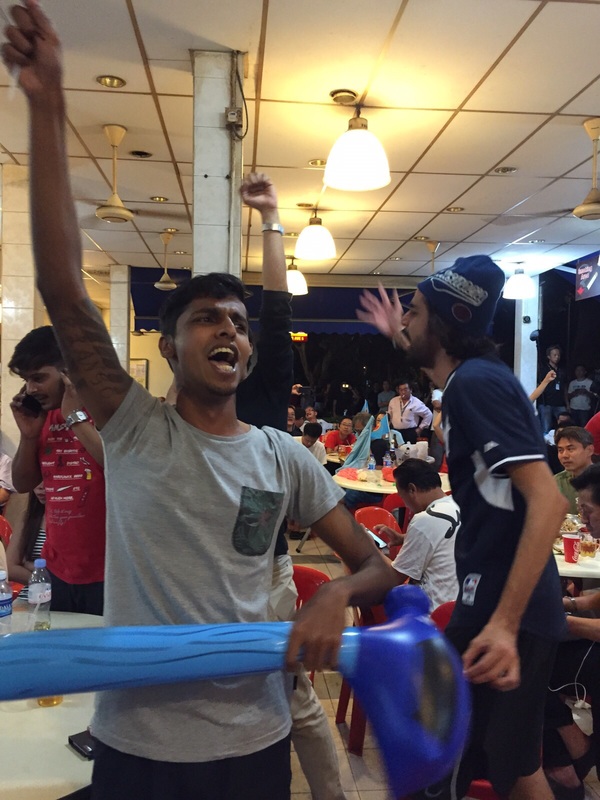 WP supporters celebrating at a coffeeshop after Aljunied results were announced. 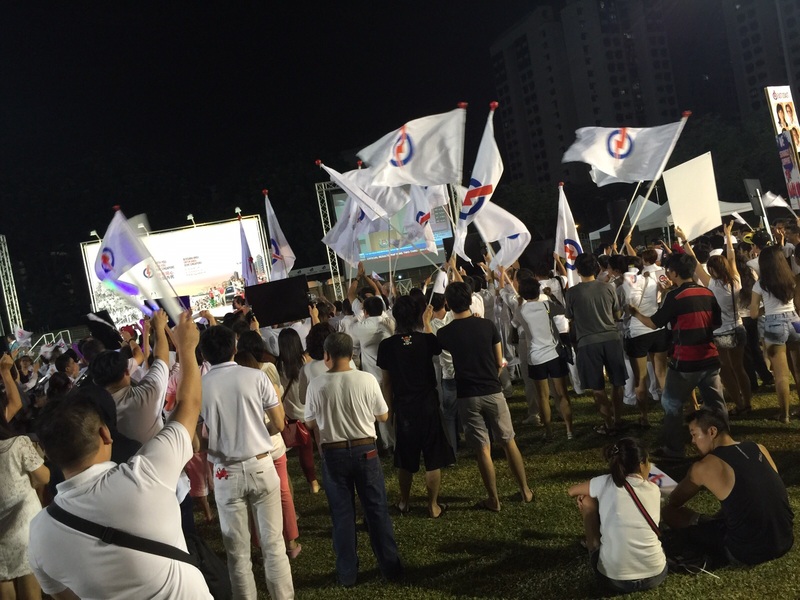 The last of the General Election 2015 results are out. 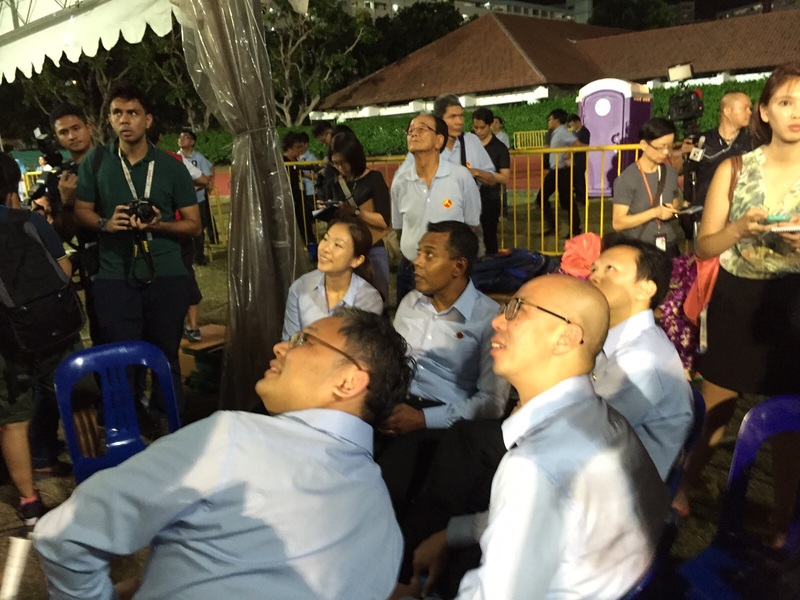 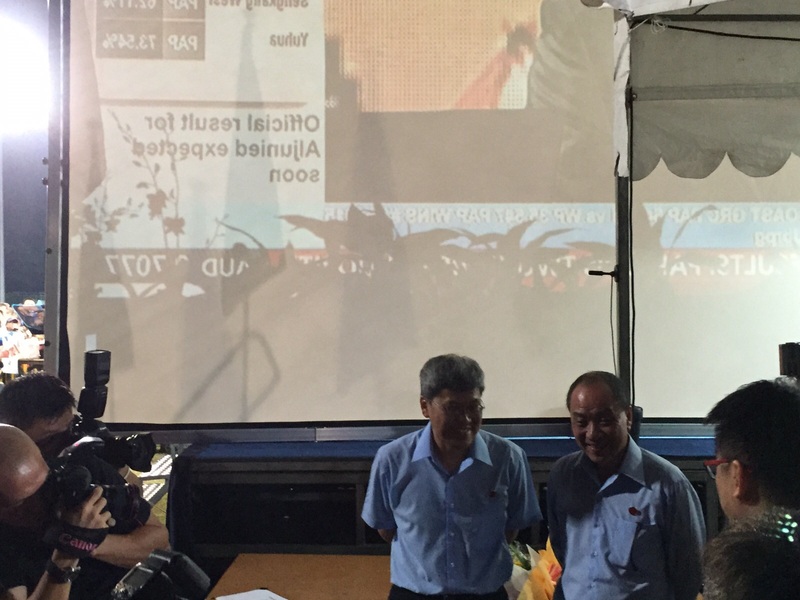 WP retains Aljunied GRC with a slight margin of 50.95% of the votes. 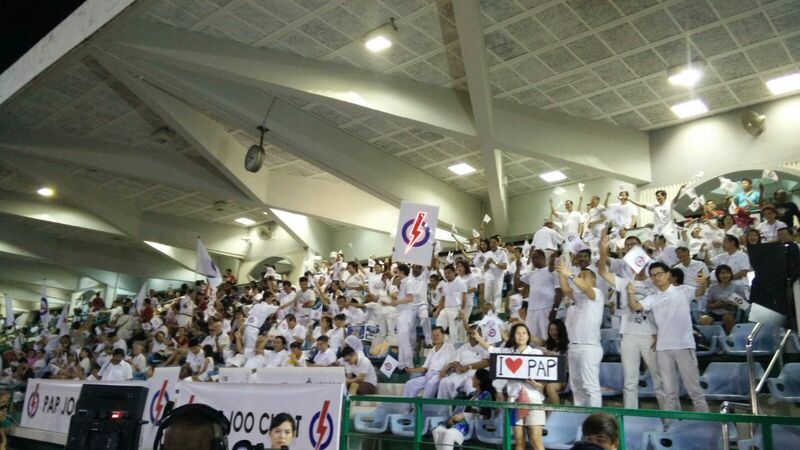 PAP received 49.05% of the votes. 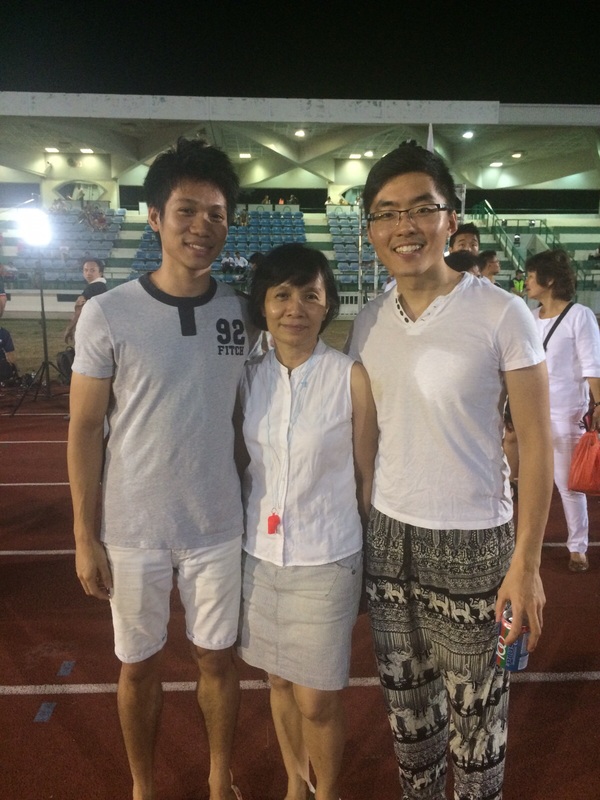 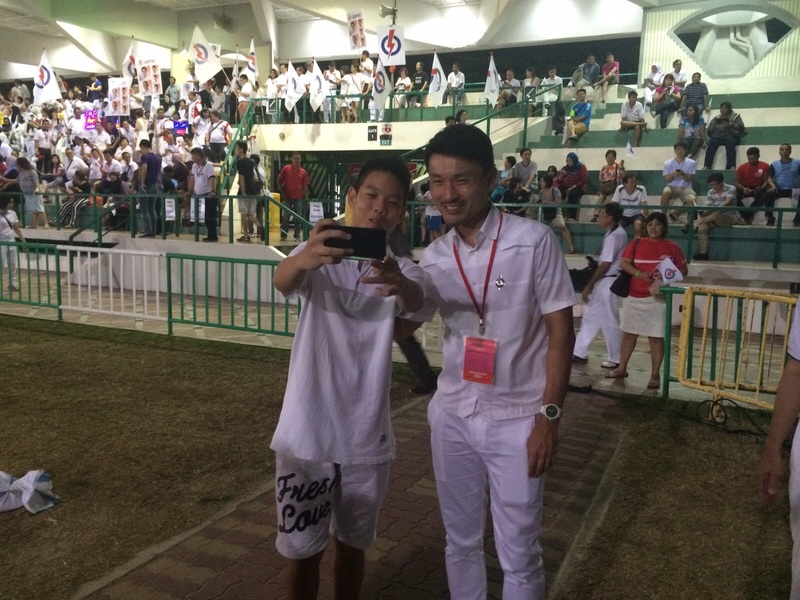 Adarrel Ho (left) and Josiah Tan (right) are both PAP supporters and first time voters from East Coast GRC. 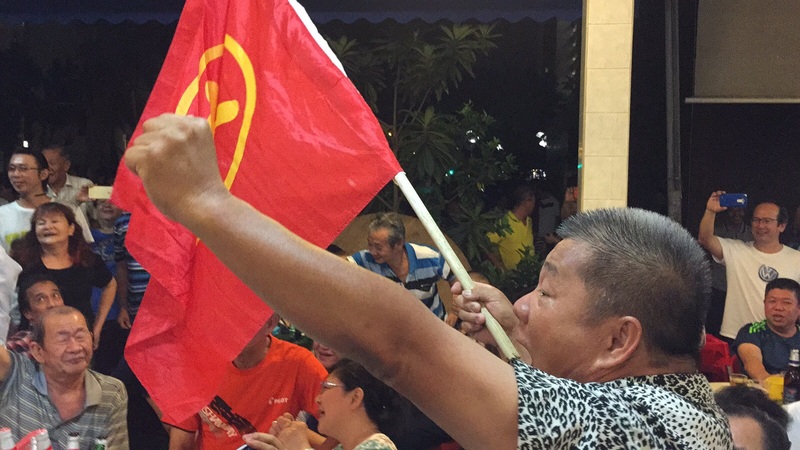 Supporters of the WP shout "Low Thia Khiang" at a coffee shop at Hougang Block 322 Avenue 5 as Aljunied GRC is won by Low Thia Khiang and his team. 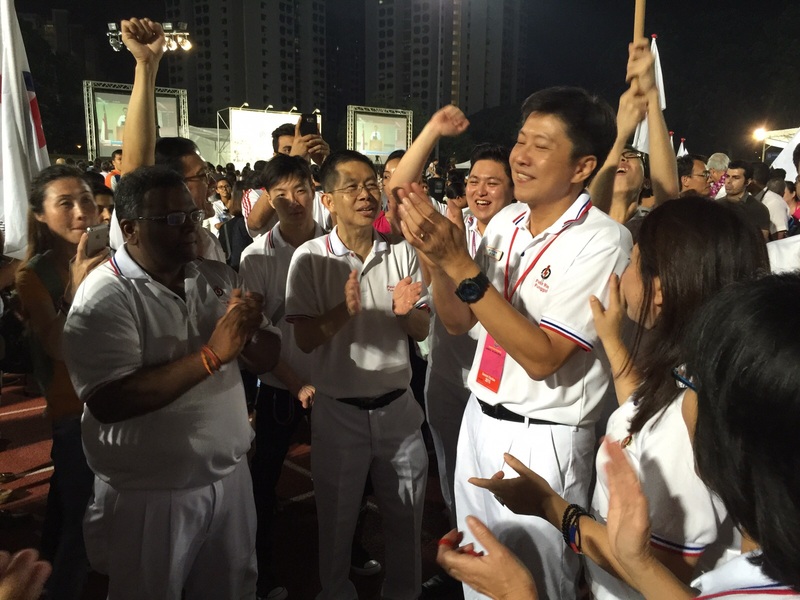 PAP has won 83 out of 89 seats in Parliament. 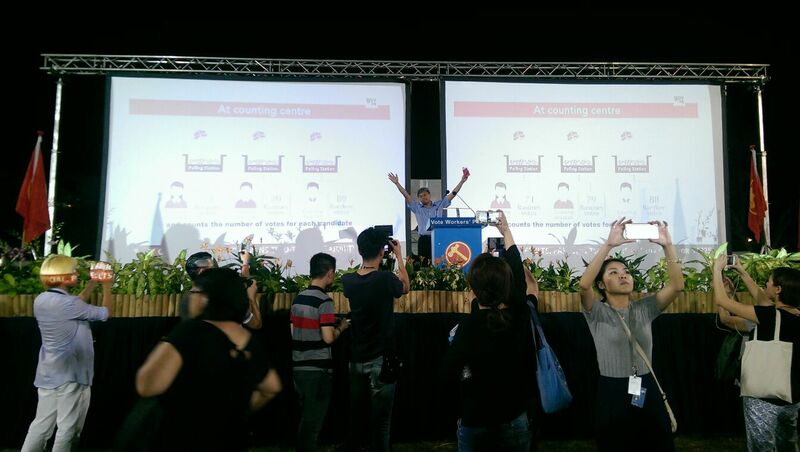 PM Lee and his team have retained Ang Mo Kio GRC. 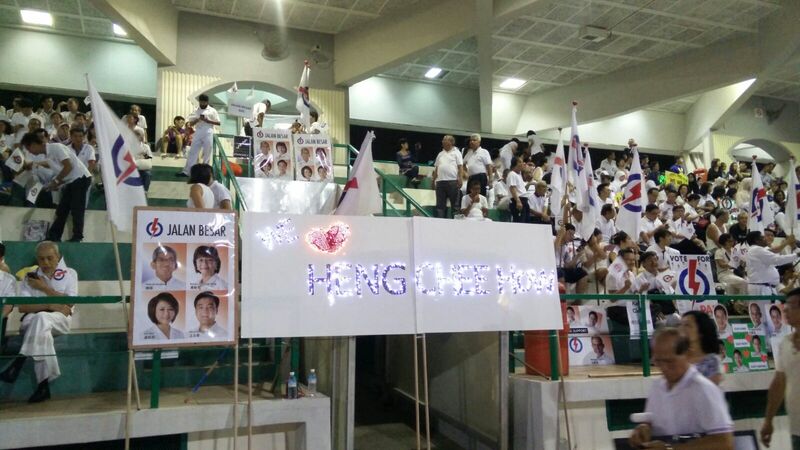 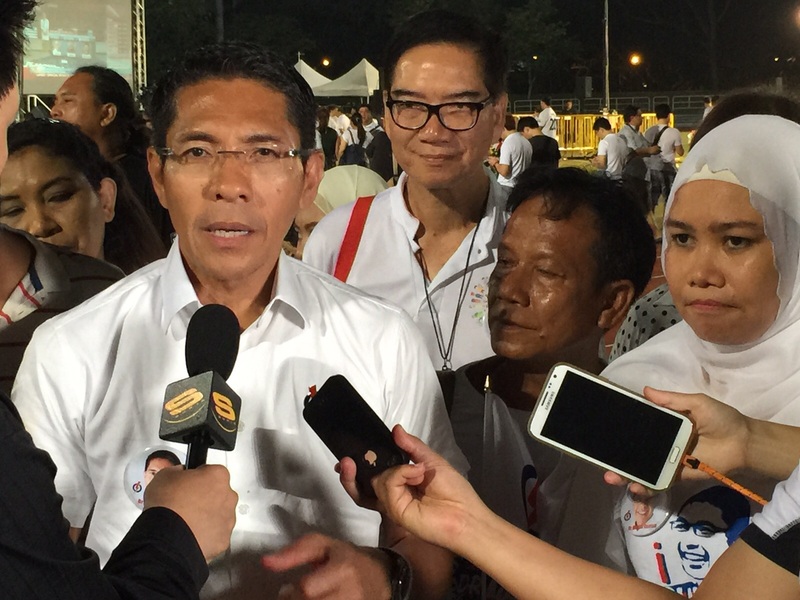 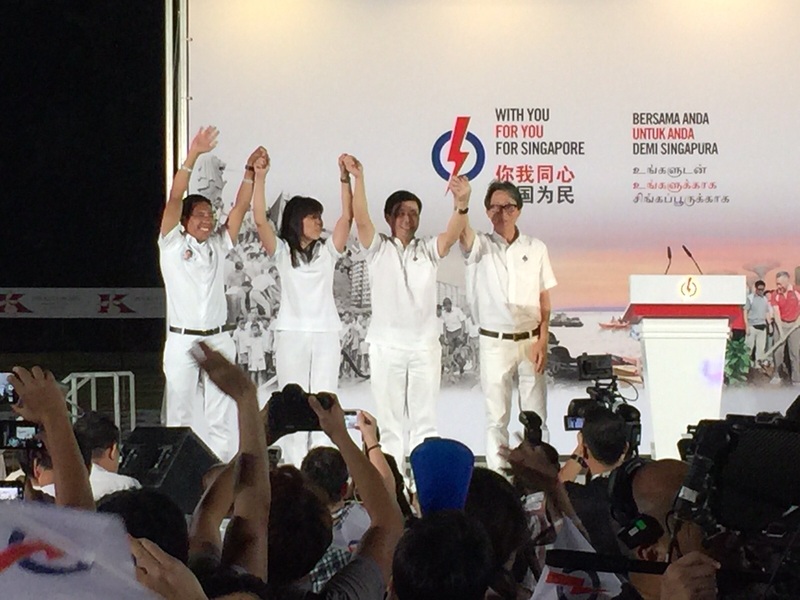 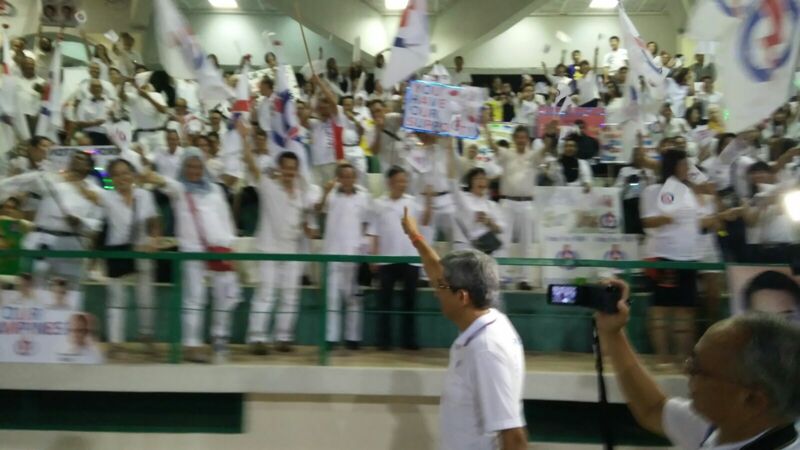 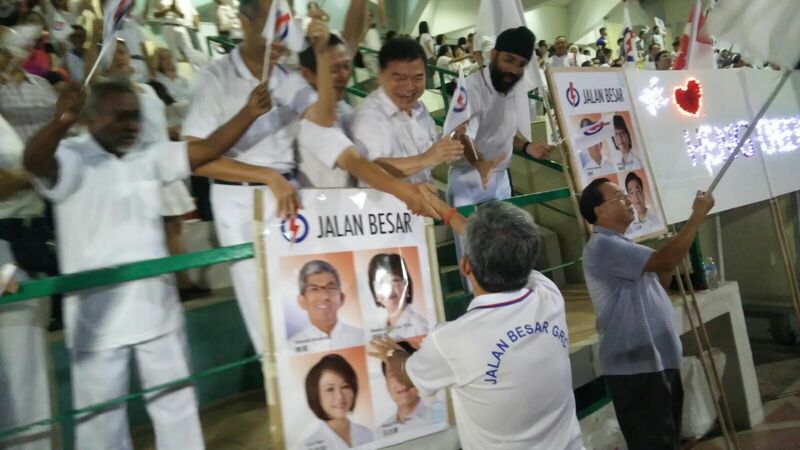 PAP team led by Yaacob Ibrahim wins Jalan Besar GRC. 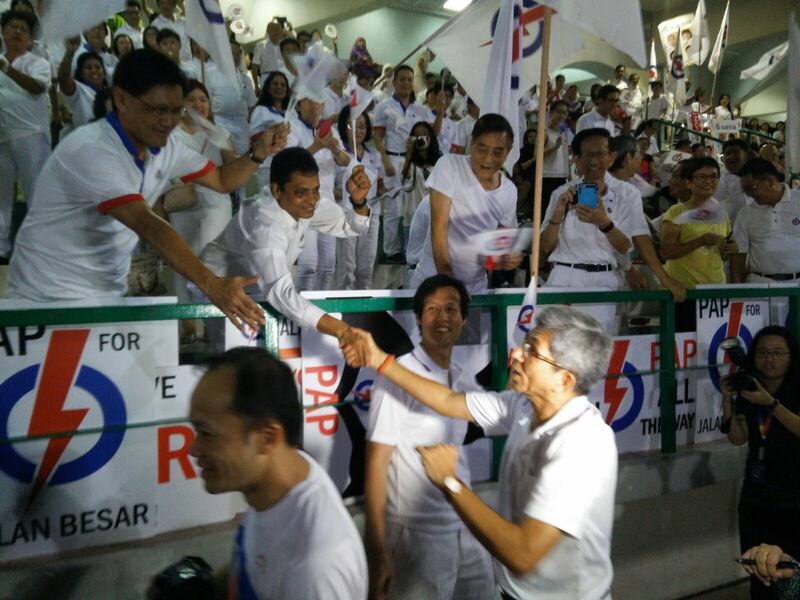 PAP: 67.73% to WP: 32.27%. 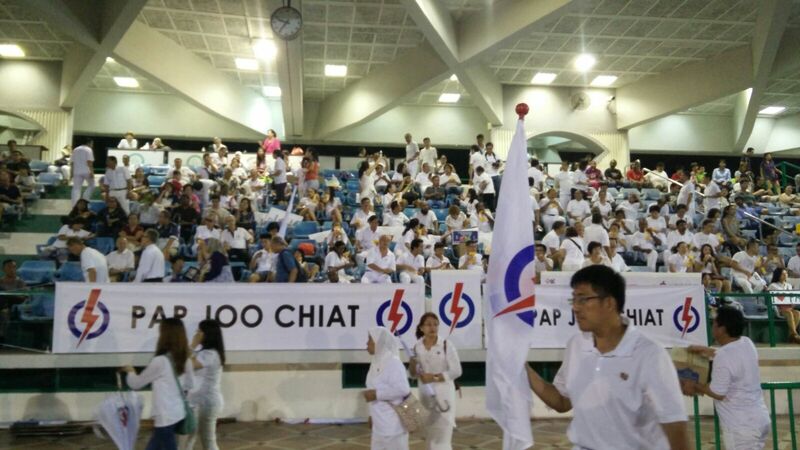 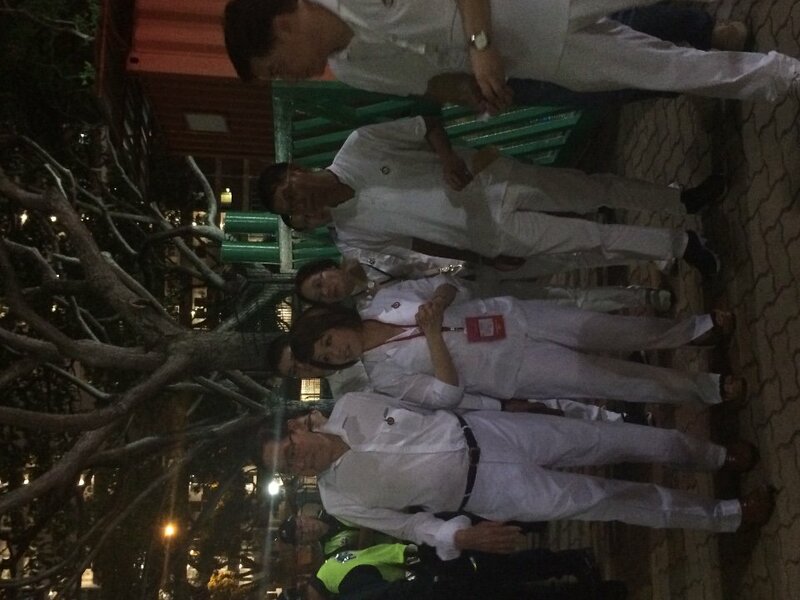 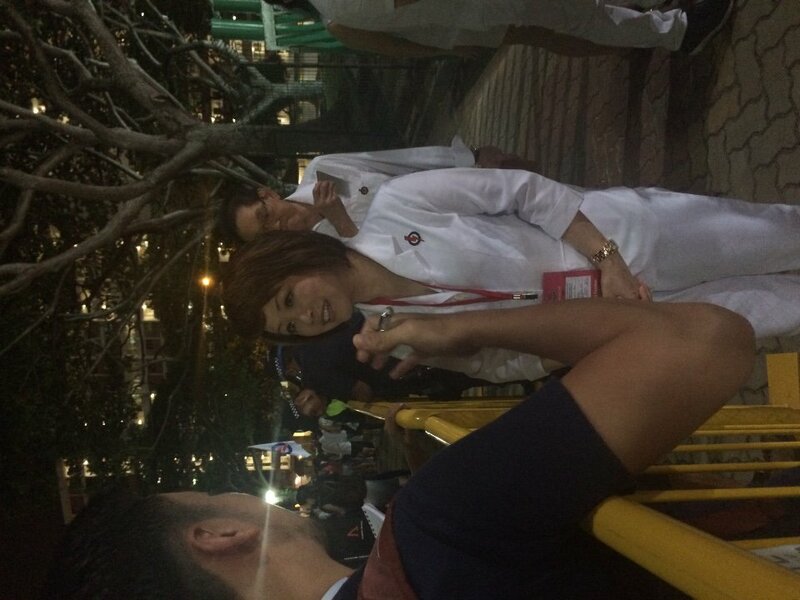 At 10:40pm: Marine Parade GRC has a sample count of 65% to PAP and 35% to WP. 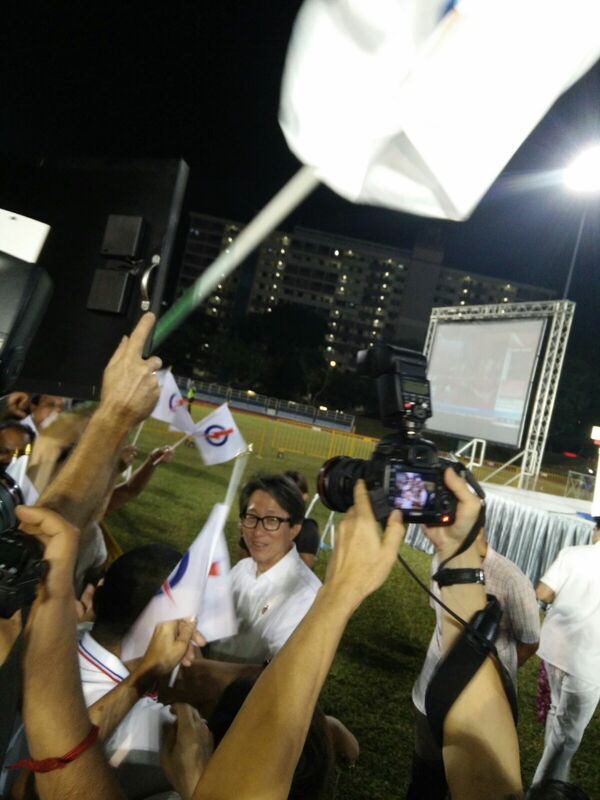 Sample count at 10:40pm: Potong Pasir GRC sees 68% to PAP and 32% to SPP. 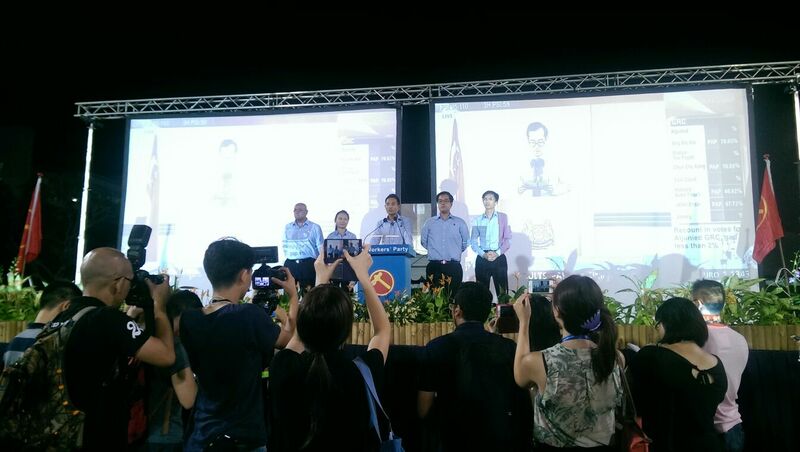 10.30pm: Aljunied GRC has a sample count of 52% to WP and 48% to PAP. 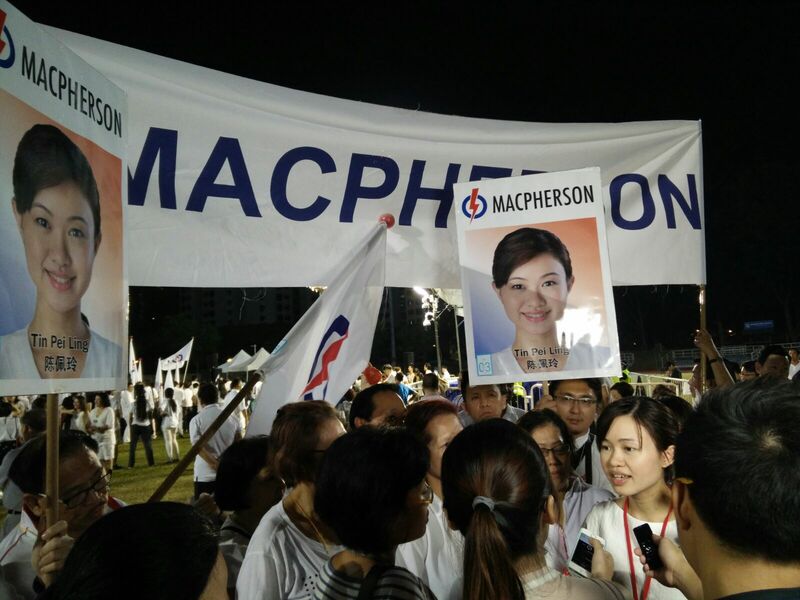 10.30pm sample count: MacPherson SMC sees 63% to PAP, 36% to WP and 1% to NSP. 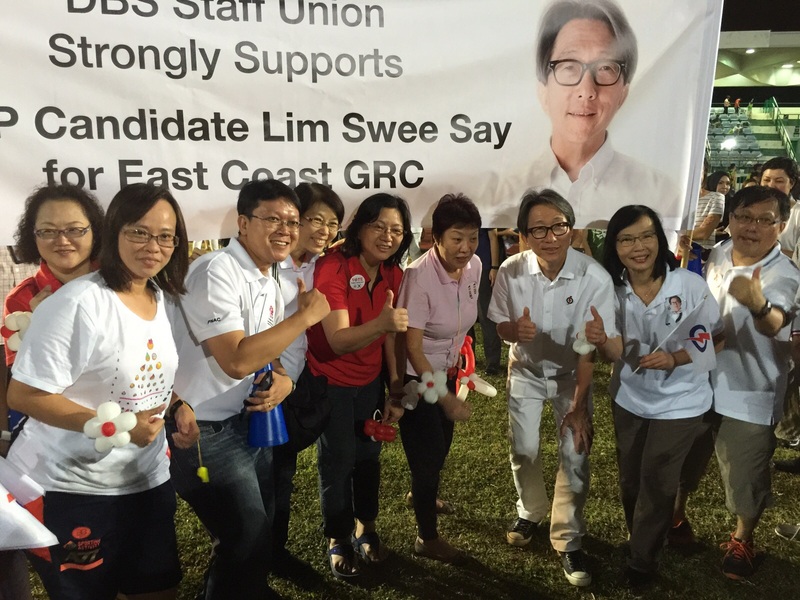 10.30pm sample count: Nee Soon GRC sees 67% to PAP and 33% to WP. 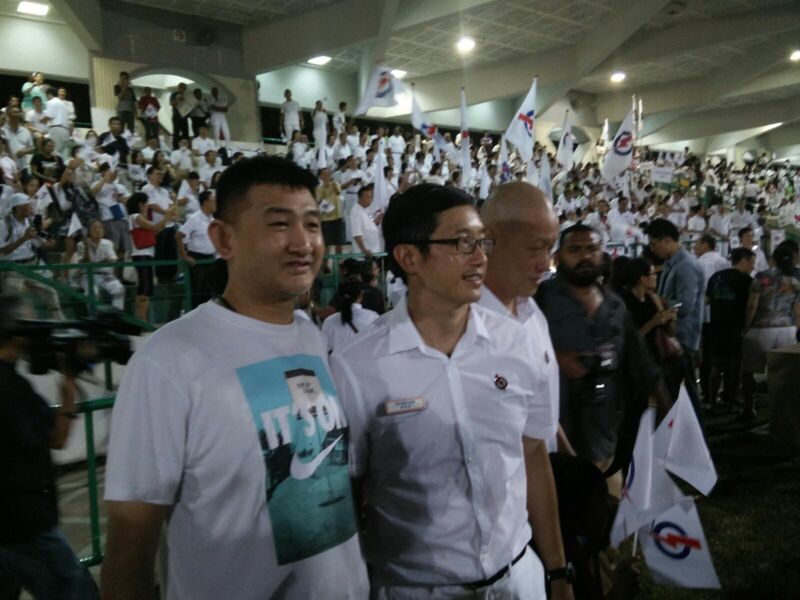 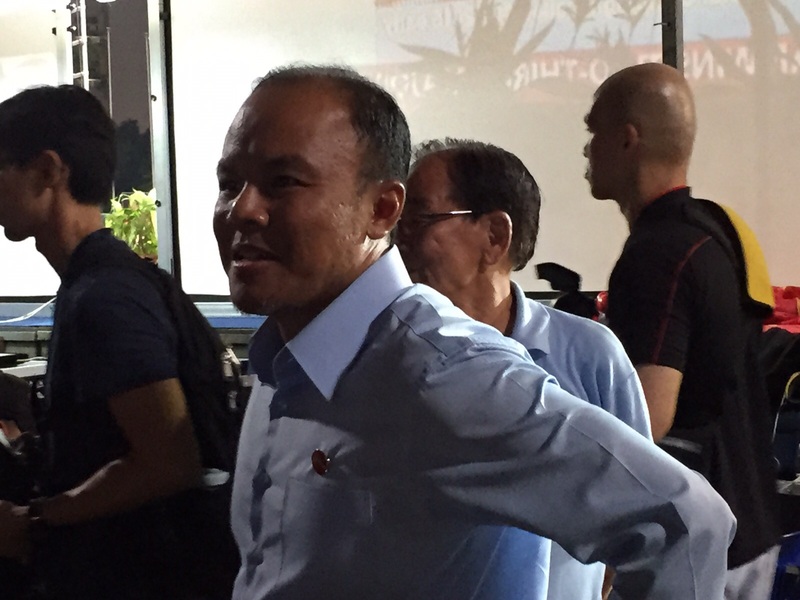 Tan Chuan-Jin arrives at Bedok Stadium. 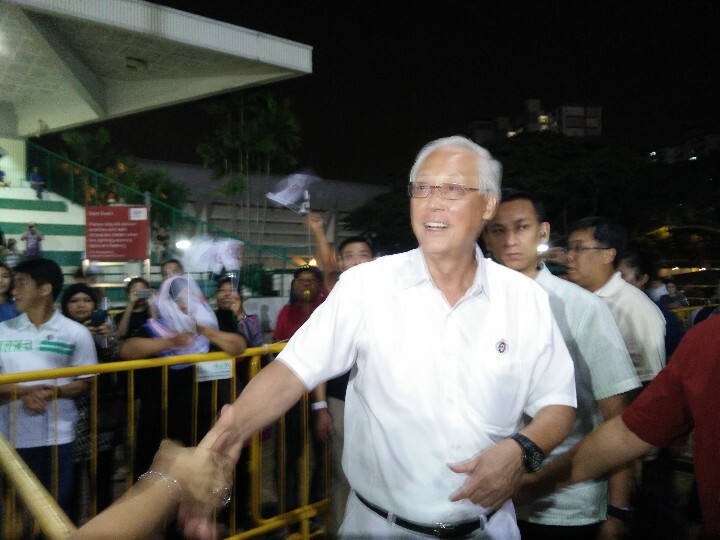 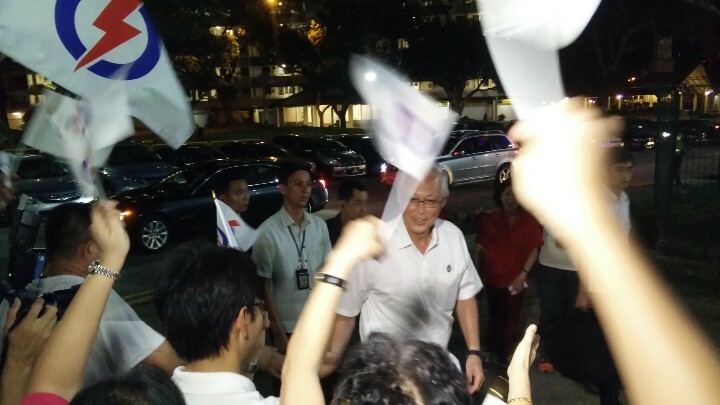 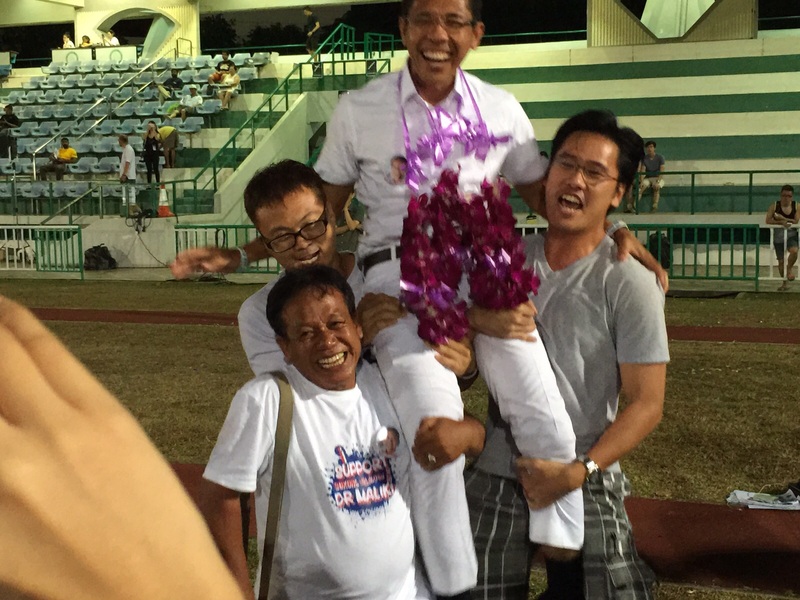 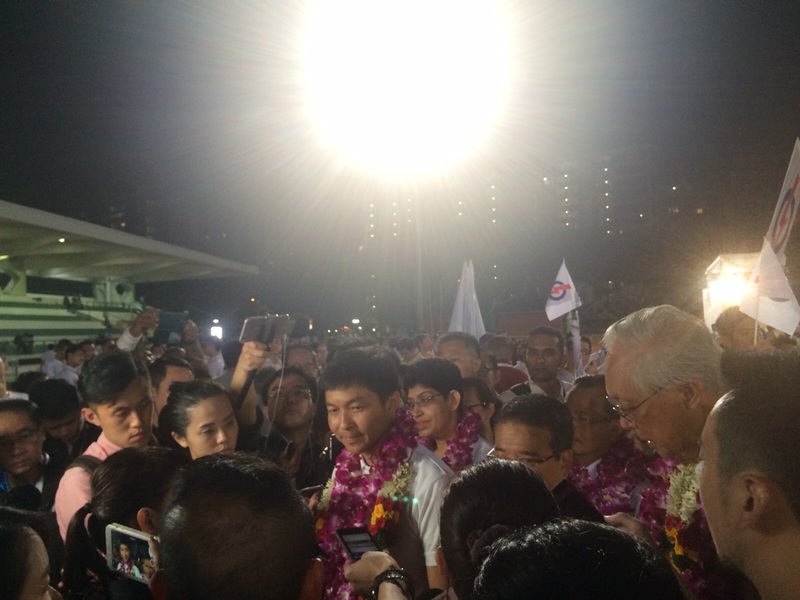 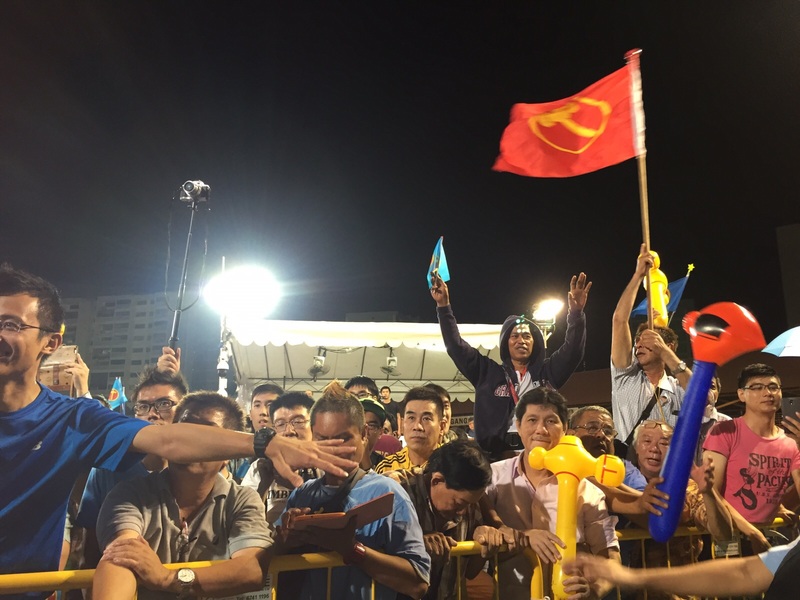 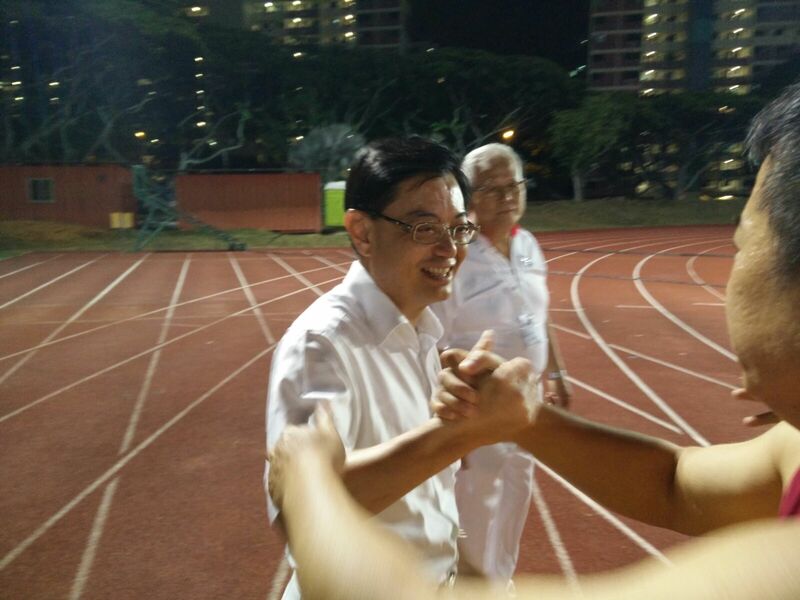 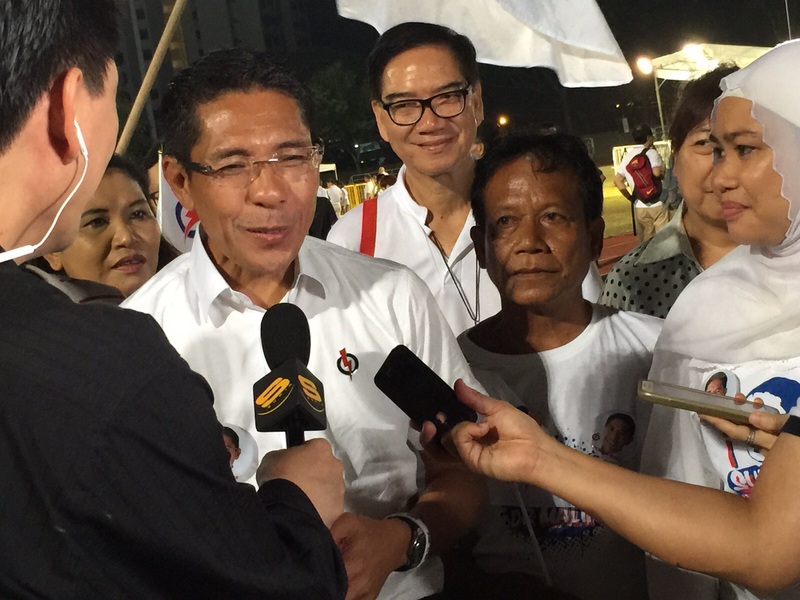 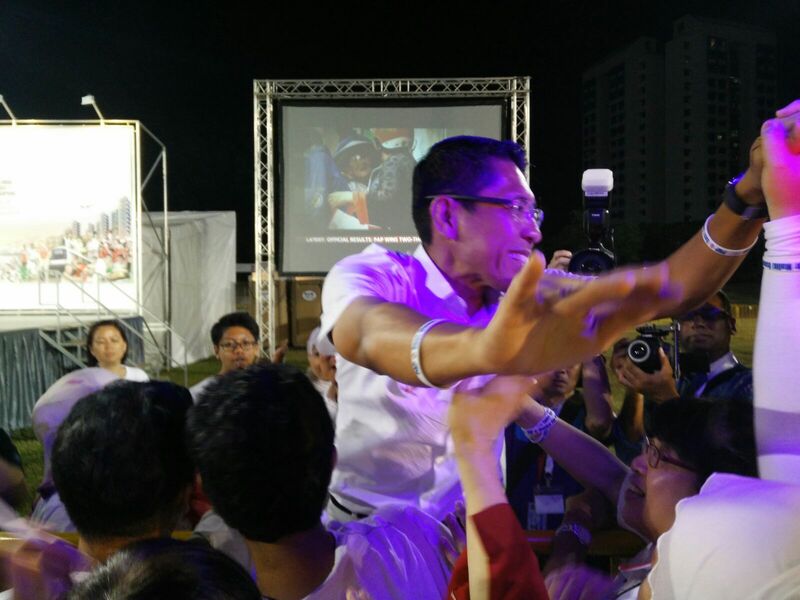 Yaacob Ibrahim arrives and greets supporters at Bedok Stadium. 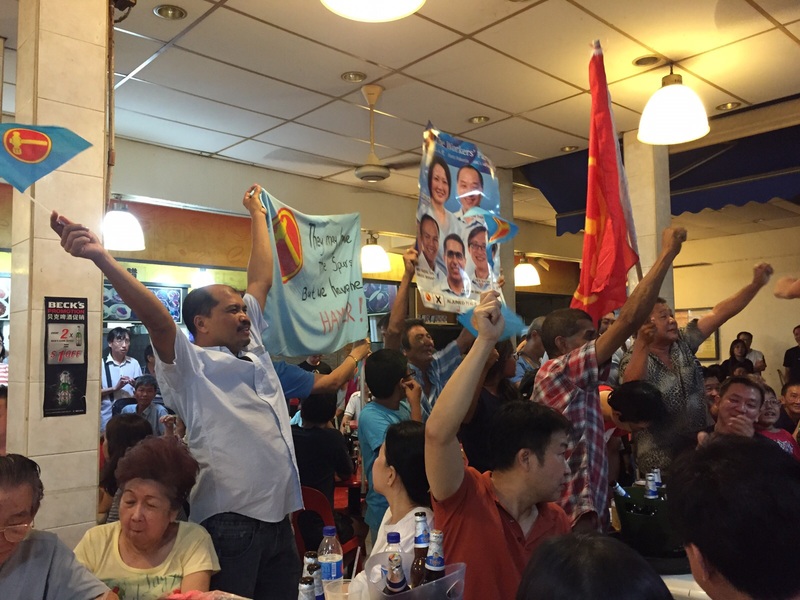 WP supporters cheering as sample count results come in. 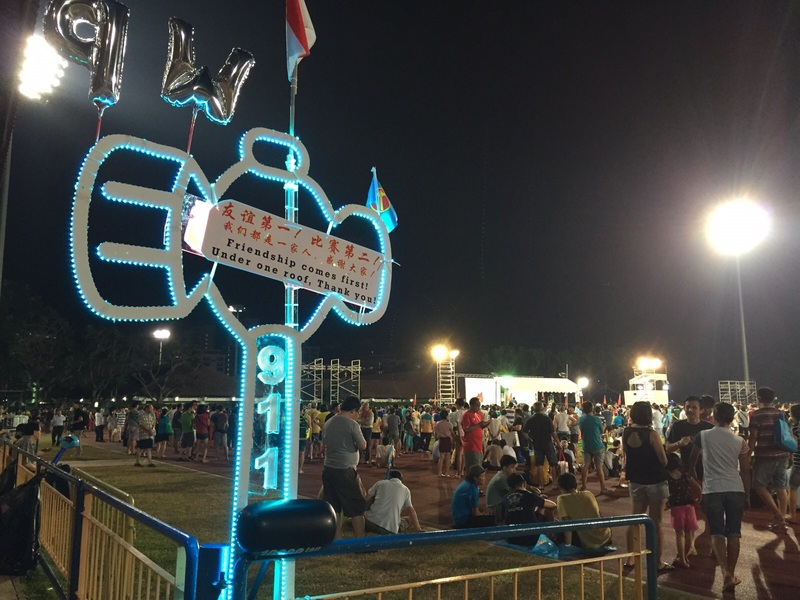 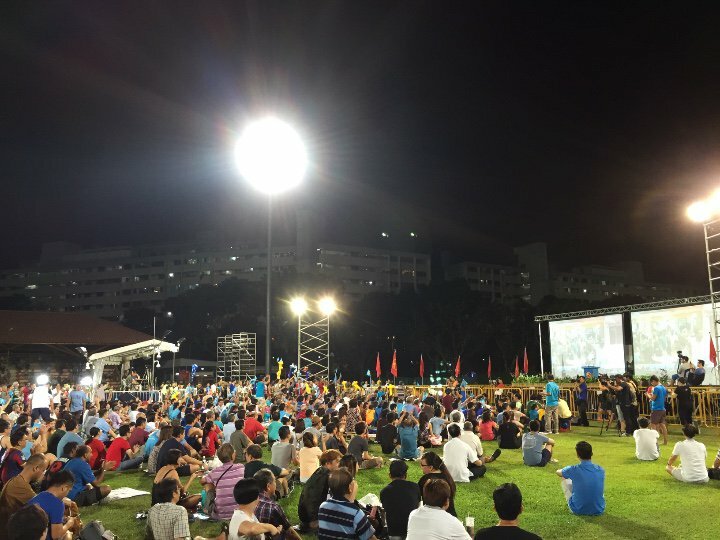 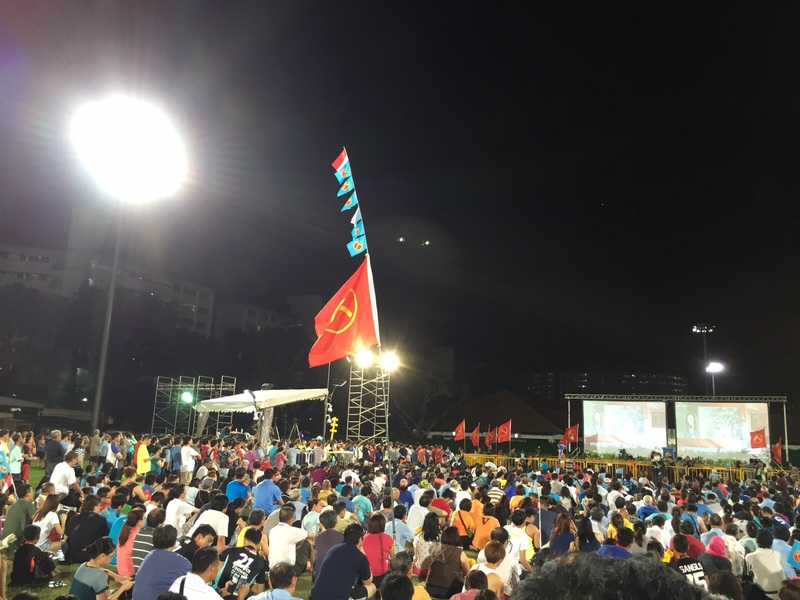 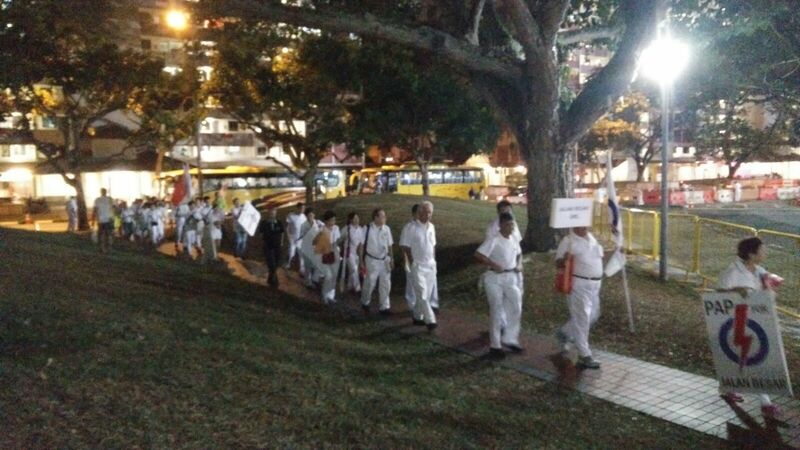 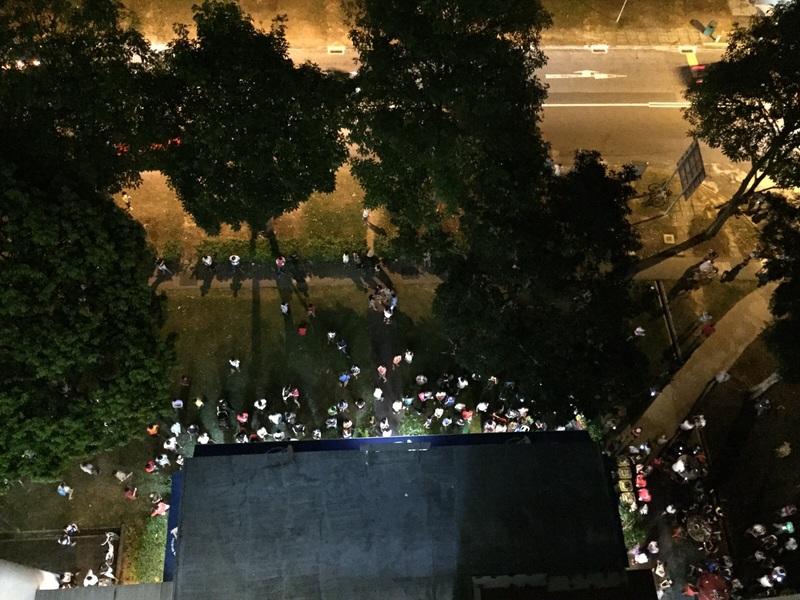 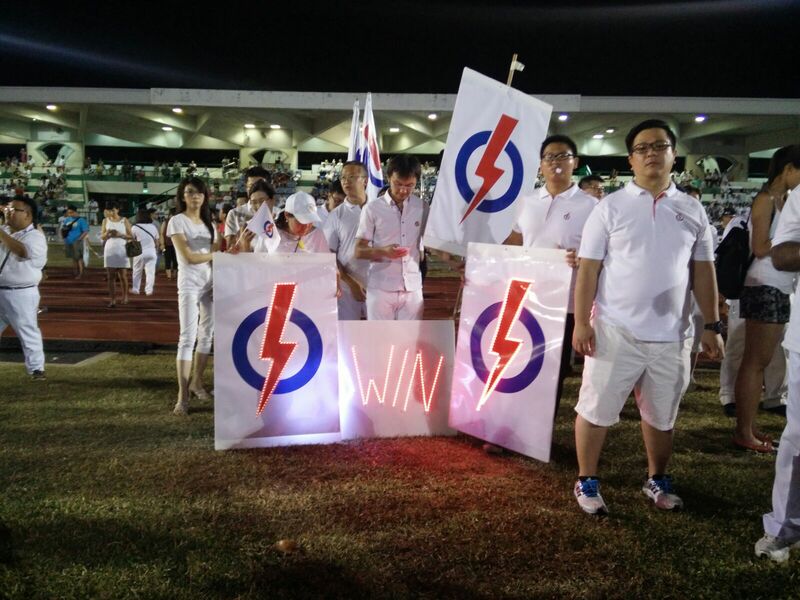 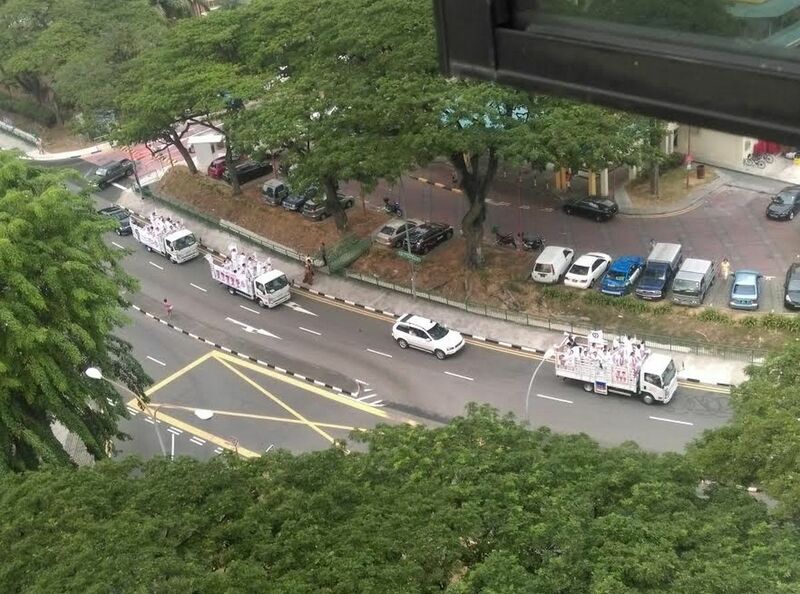 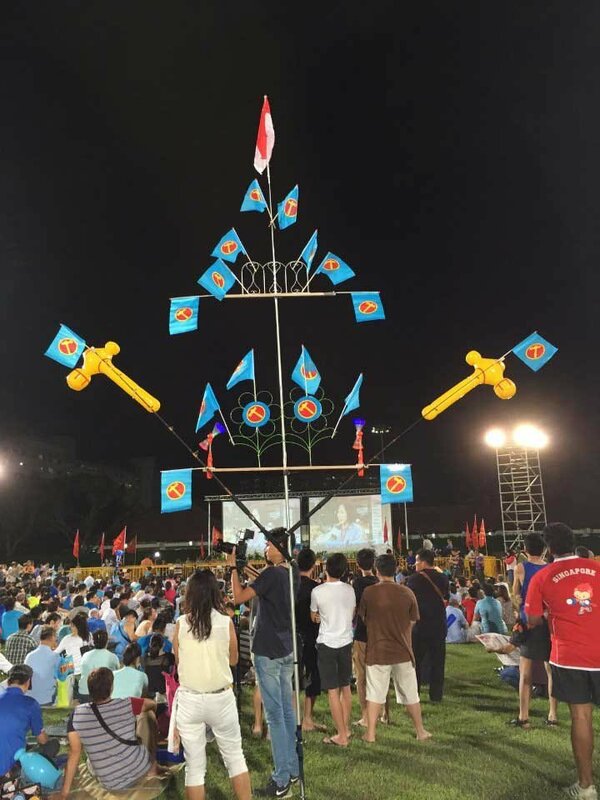 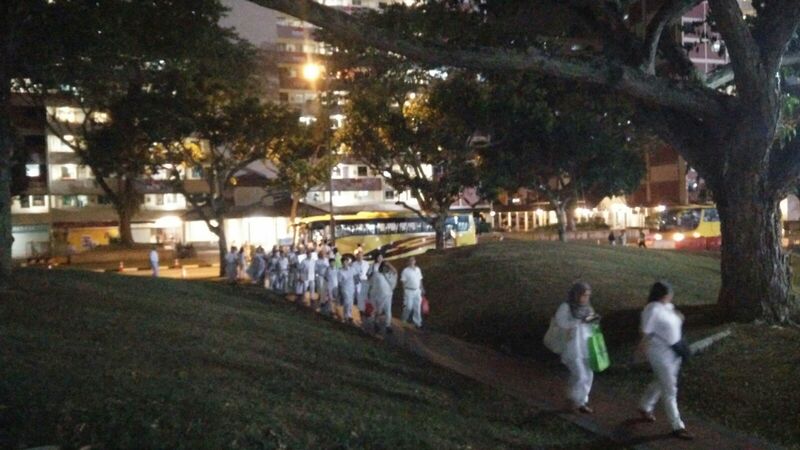 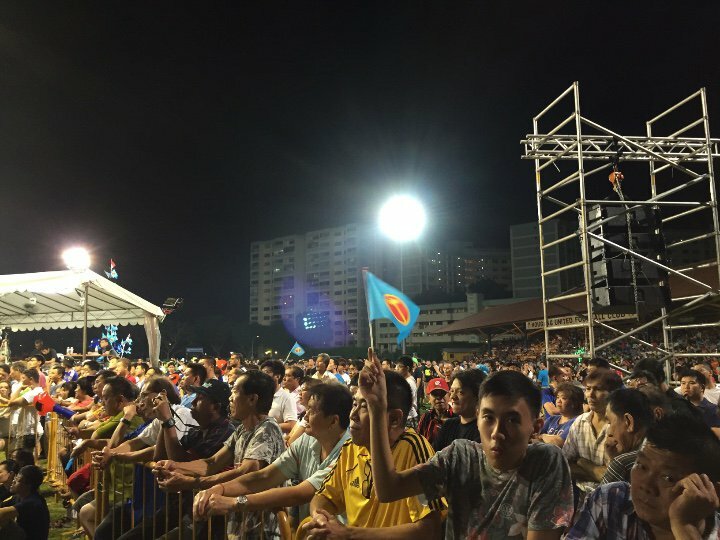 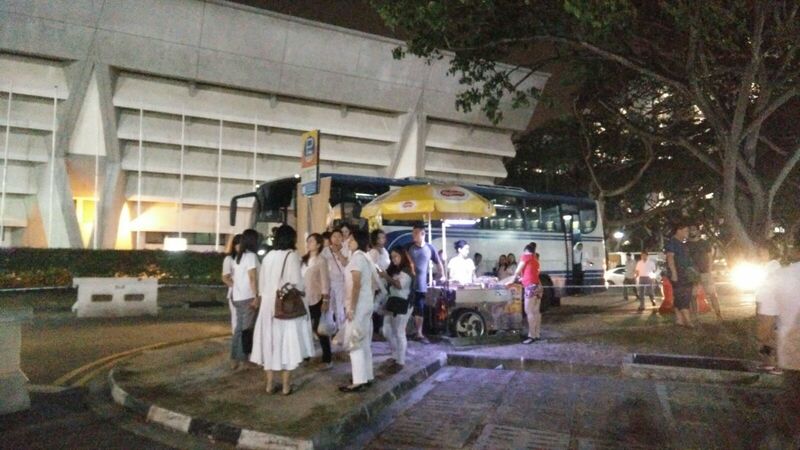 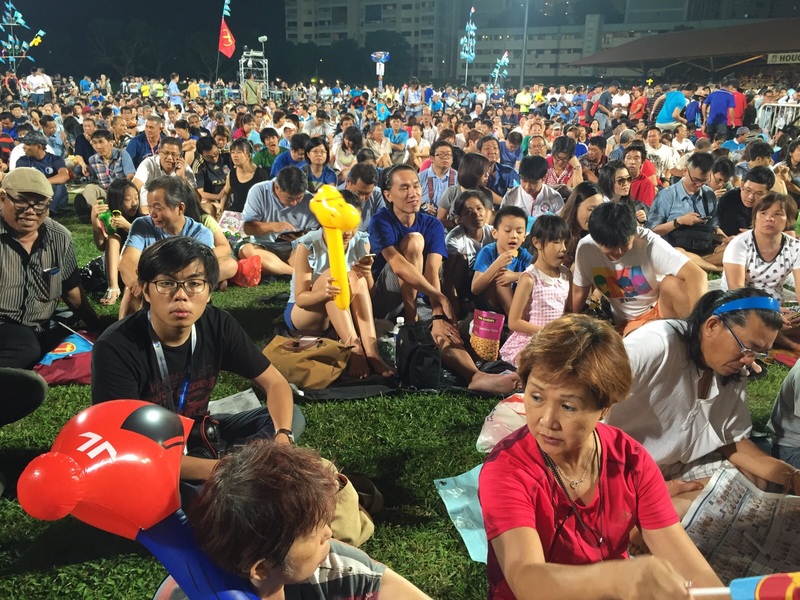 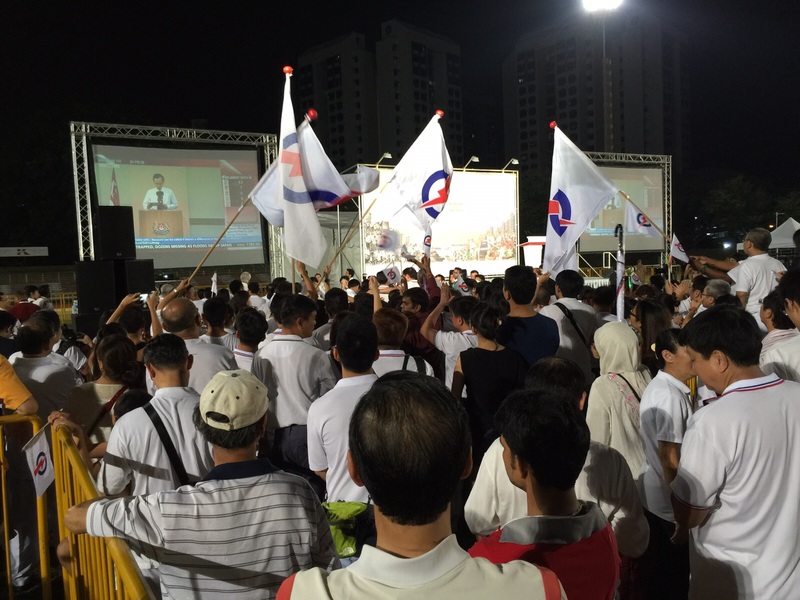 Workers' Party supporters gathered in Hougang at 9pm on Sep 11.